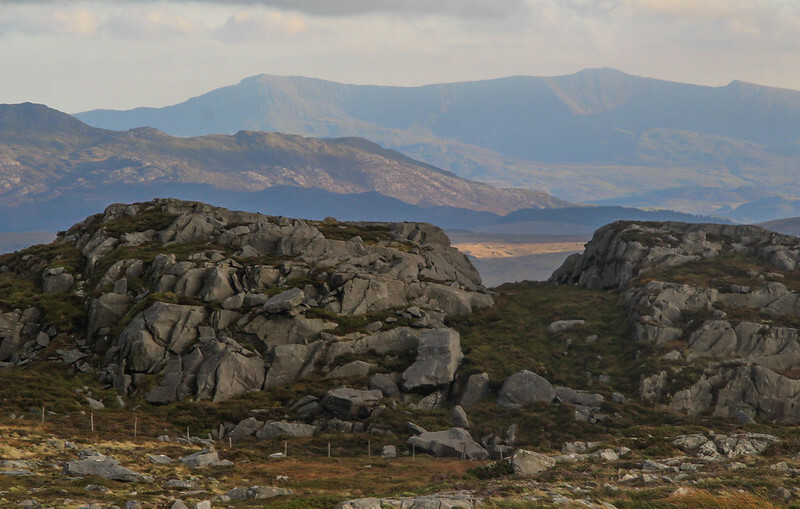 The Rhinogydd, known colloquially as the Rhinogs, lie between southern Snowdonia and the sea, making up the high ground between the stunning estuaries of the Afon Glaslyn to the north, and the Mawddach, glistening beneath towering Cadair Idris, to the south. 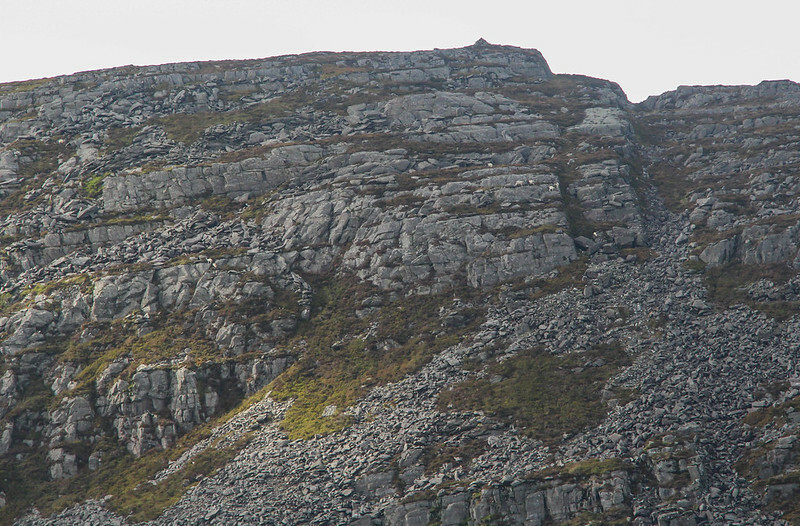 The wildly undulating spine of the hills is made up of some quite unusual rocks, a type of sedimentary greywacke. 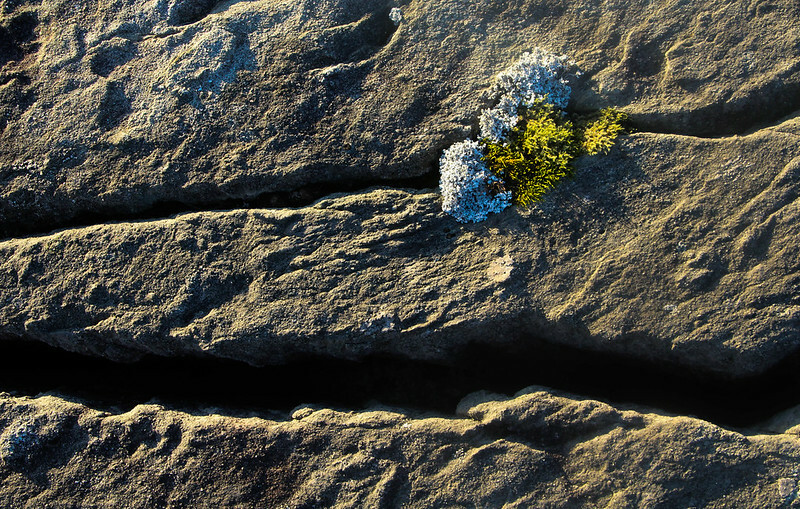 This has the feel of something a little like gritstone, a little like Torridonian sandstone, but tougher than both, with sharper edges, for it was likely laid down by undersea landslides which mixed together gravel, sand and mud before it settled. 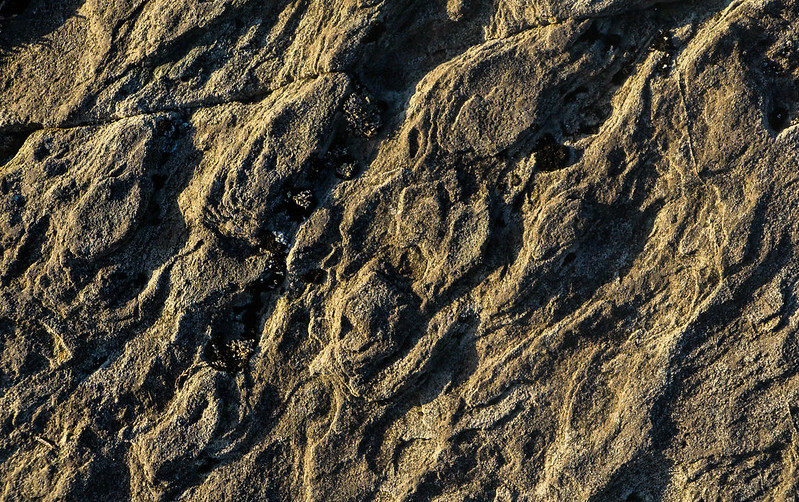 This forms a more resistant lump on top of the underlying mudstone, and hence the hills remain, stubborn in the face of the eroding elements. 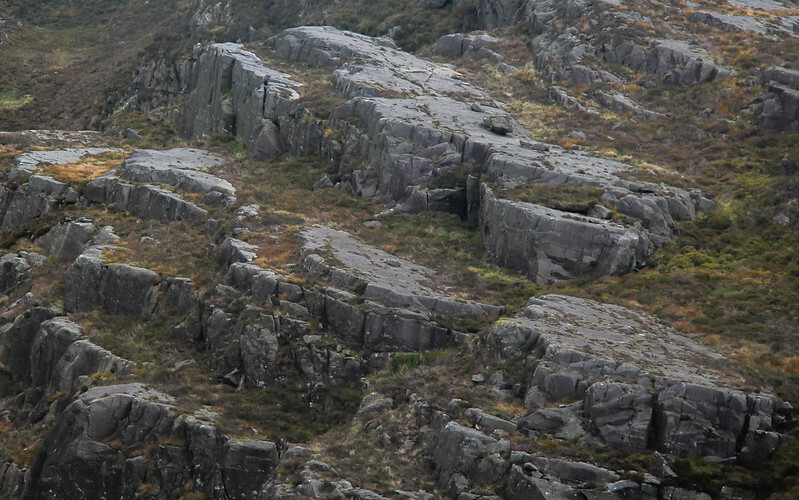 In places, dolerite dykes thrust arrow-straight through the landscape - an interesting place for the geologist indeed. 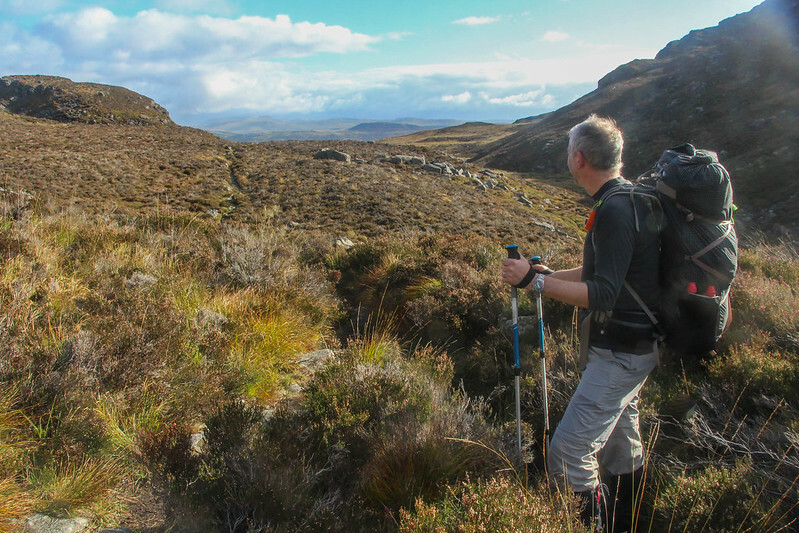 What this means to the hillwalker, is a fascinating and complex landscape, where the route ahead is often crossed by obstacles in the form of ravines or rock steps. 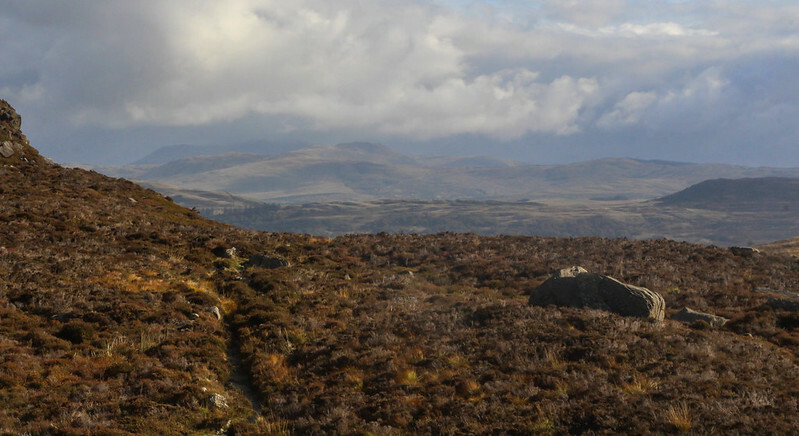 Far less popular than the bigger hills of Snowdonia, what paths there are, are faint and hard to see, and the best route is not always obvious, and not always found! To add to the fun, the heather here is thick, and lies lightly on the ground beneath, where hidden rocks and holes abound. 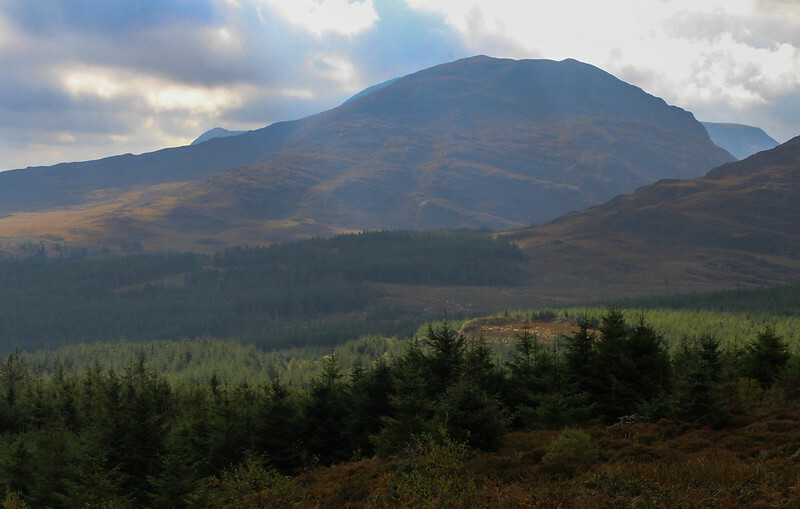 For a long time, I've fancied walking in these hills. 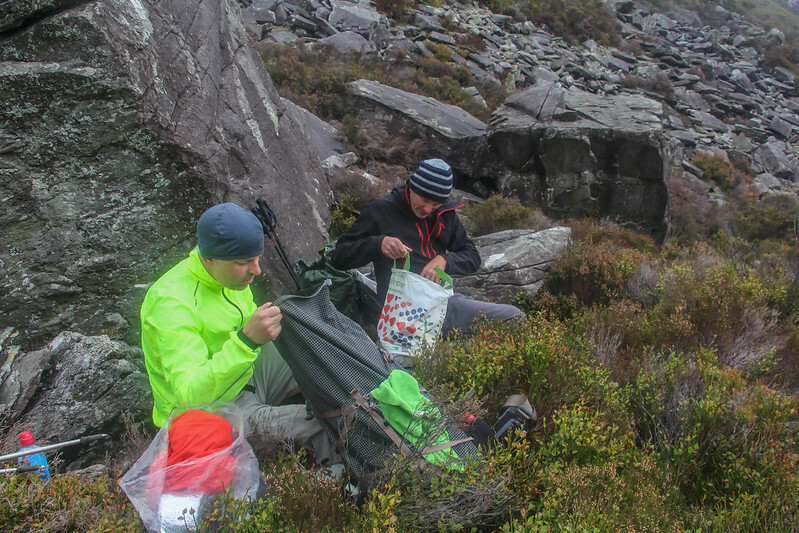 My mates and I are regular winter walkers, often frequenting the highlands in all conditions, and often carry loads of gear, wood and food into bothies. 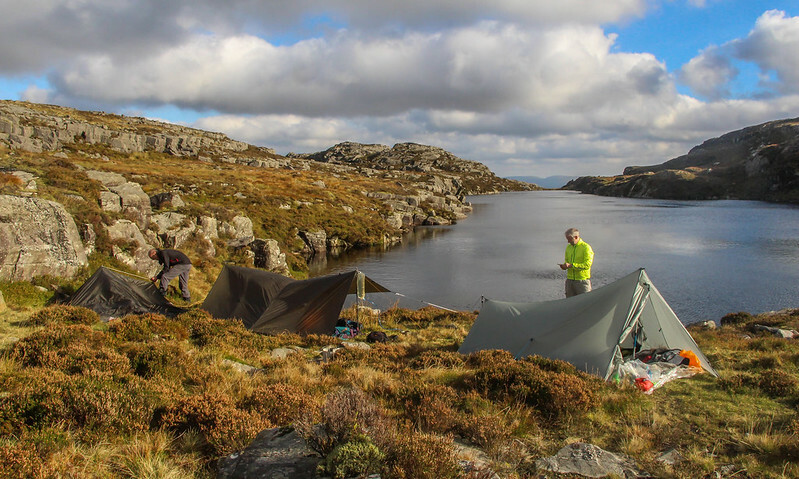 We also regularly wild camp for a week or more by canoe, a craft which allows far more equipment to be carried than is necessarily sensible. Its a long time, though, since I've carried camping gear on my back for more than a single night, so this planned 3 day trip would be a bit of a test for us in such rugged terrain, especially as we're all soft southerners these days, and our usual fitter companion, Steve, lives too far away in the frozen country north of the wall. So there was even a little note-comparing in advance to avoid duplication of items between Nige, Ade (substitute for Steve!) 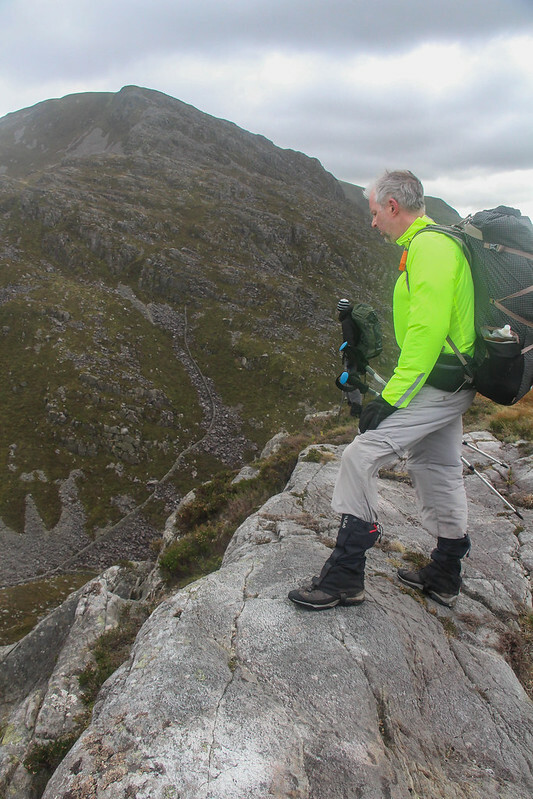 and myself, and in the end our packs were far lighter than those we take to bothies. 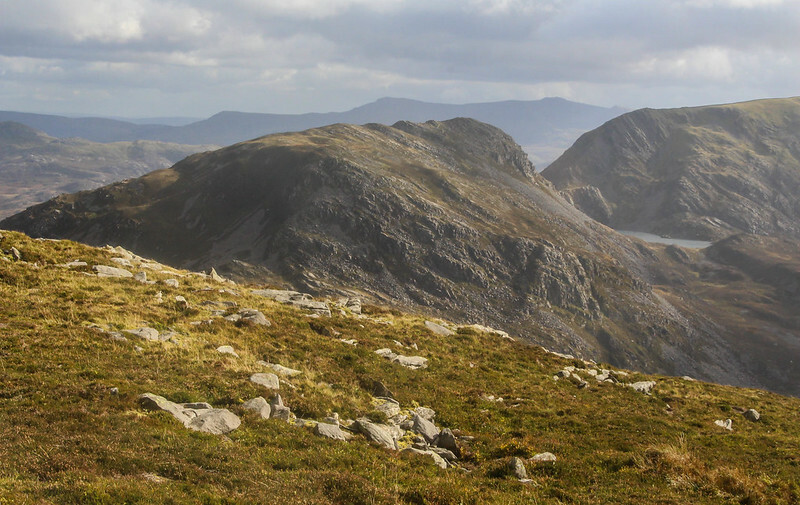 Originally we'd talked about a north to south traverse, but a little research on the likely pace we might achieve through these hills made me cautious of such a commitment. 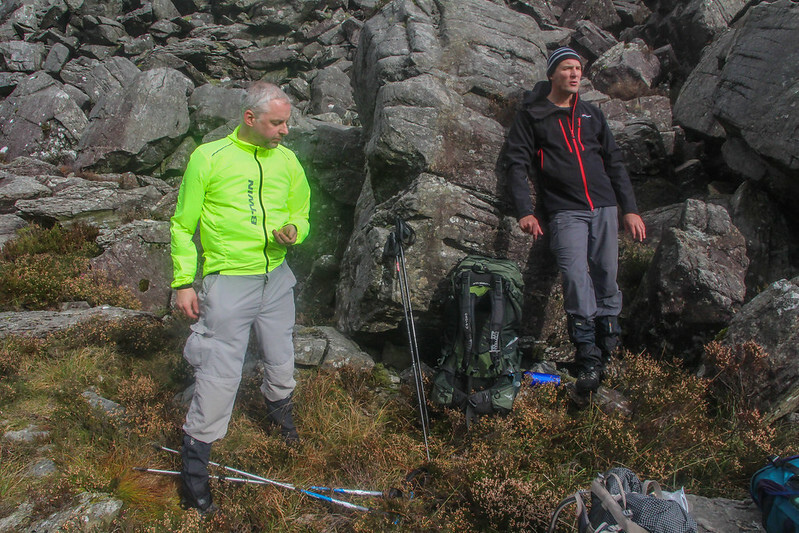 I planned a circular route from the east which would allow us to keep our options open, take in the main hills, and offer a possible there-and-back extension to the further summits. After an overnight in a pub bunkhouse near the border, we found ourselves grabbing the last parking space late on a Saturday morning at the end of September. 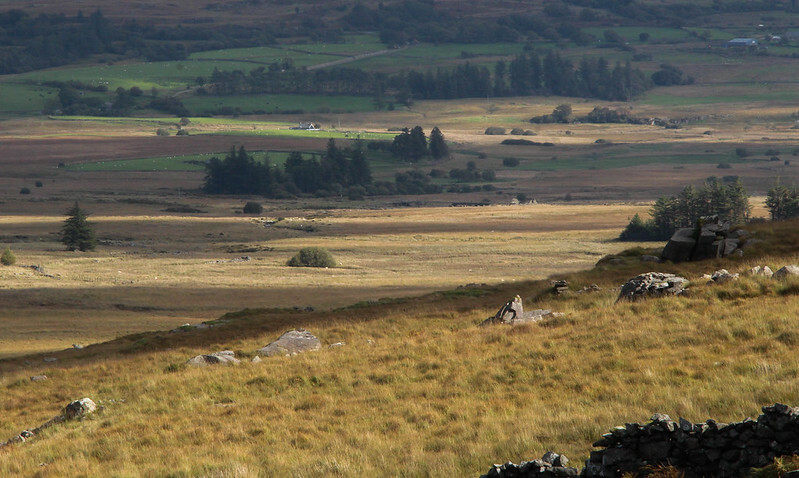 On the eastern flanks of the hills, the land is rolling moorland, in part clad with large plantations. 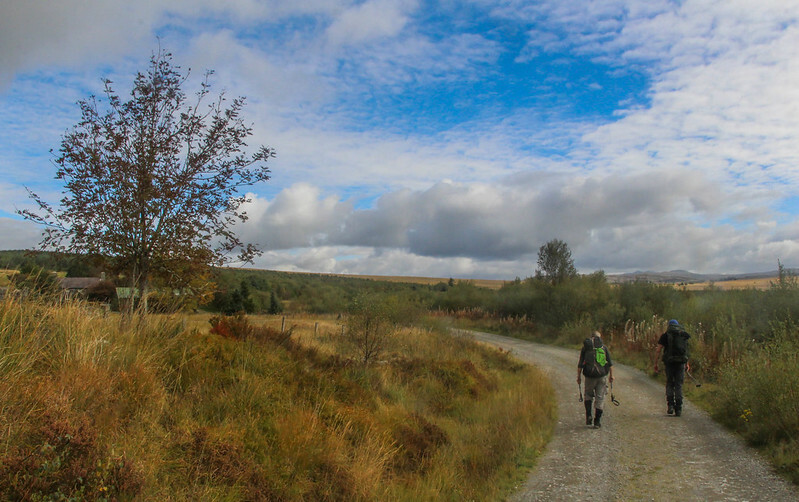 Our walk would start through the edges of the forest, before heading north to the cwm above Wern-Fach and swinging west up onto the ridge. A helpful local at the old farm at Graigddu-isaf advised us against following the right of way, for apparently it hadn't been maintained for years and crossed areas of dreaded "cleared" forest. Instead, we climbed gently on the wide forest roads to the highest point within the plantations, with our first views of the highest hills, where we rejoined the track and headed north. For the first few hundred metres, way-marked posts every couple of minutes pointed the way. As soon as the terrain got remotely confusing though, these immediately disappeared of course. After a brief stumble into boggy tussock ground, we returned to a very faint path, and crested the hill to look over on the cwm below. 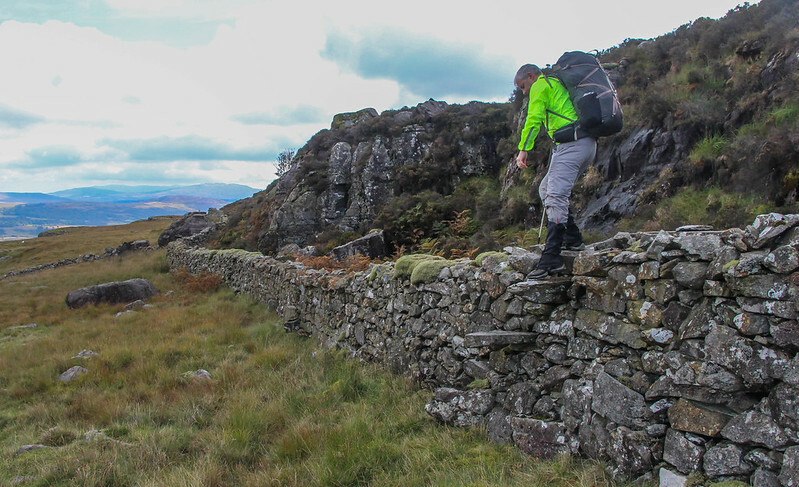 Here, rather than lose height, there appeared to be a contouring route across the cwm above the highest wall, and we chose this route. 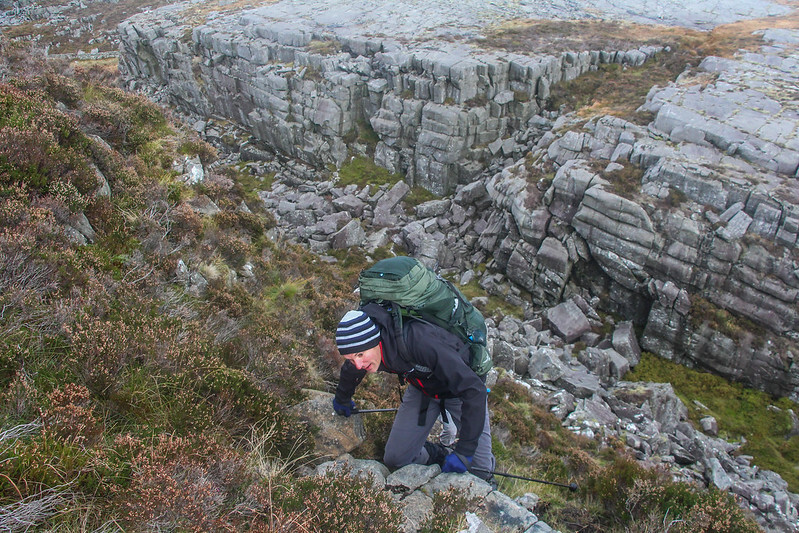 Though there was no path, and the moorland terrain was a little rough at times, this proved a simple enough option. 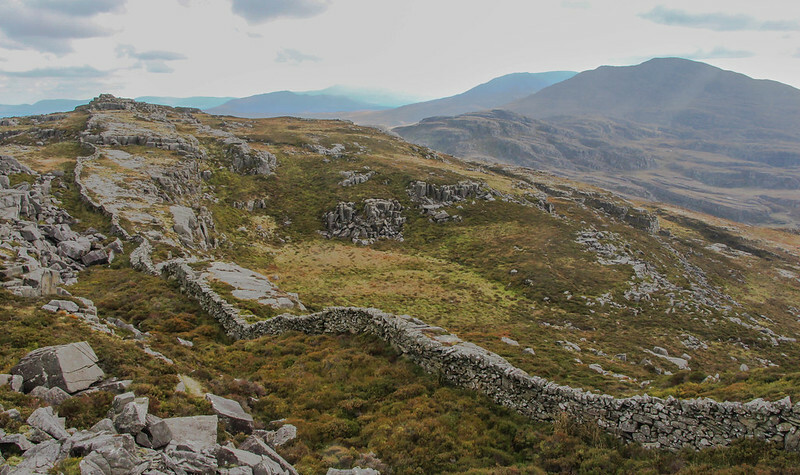 Near the end, we crossed the wall with use of built-in slab steps, and lunched on a very convenient flat rock with endless views out over the sun-and-shadow speckled valleys of Wales. 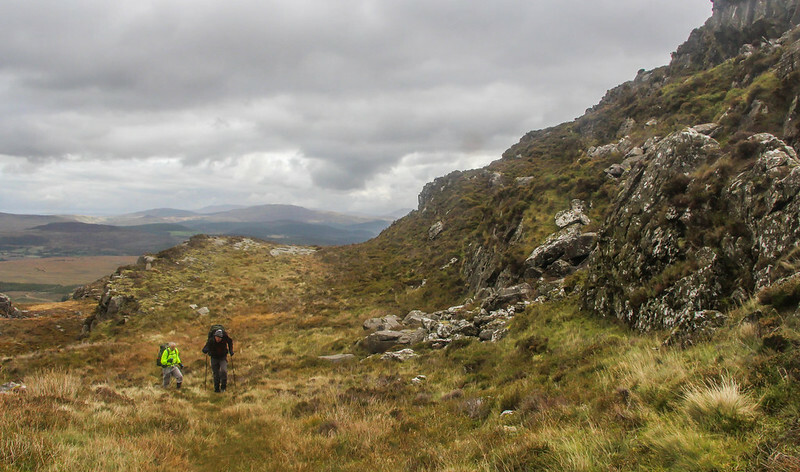 We soon joined the "main" track up from Wern-Fach and commenced the climb up to the ridge itself. I say track, but it was really just a small path, yet this would be pretty much the biggest trail we'd follow for another day or more. The climb was easy, and as we came up to the top of the bwlch, suddenly the sea was sparkling ahead of us, far below. 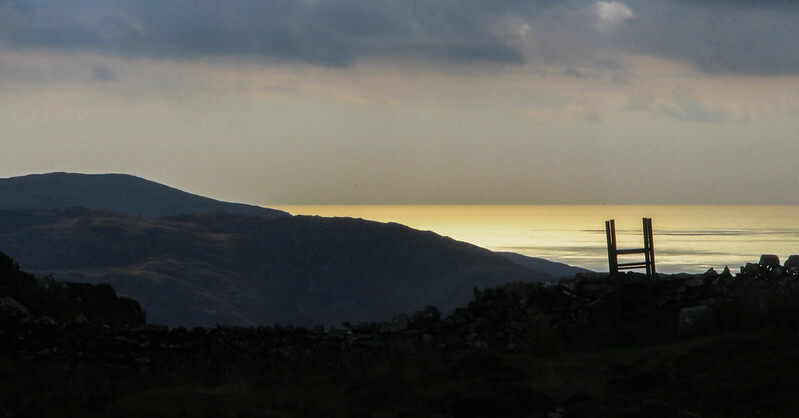 This is one of the joys of these hills, the ever-changing waters of Tremadog Bay, framed by the line of the Lleyn Peninsular beyond, a constant companion to the west. 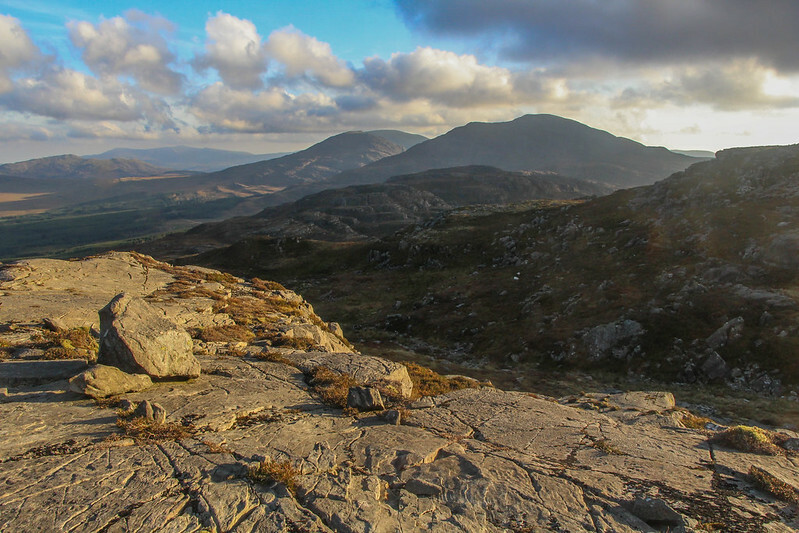 Our destination for the night was Craig Wion, the next summit to the south. 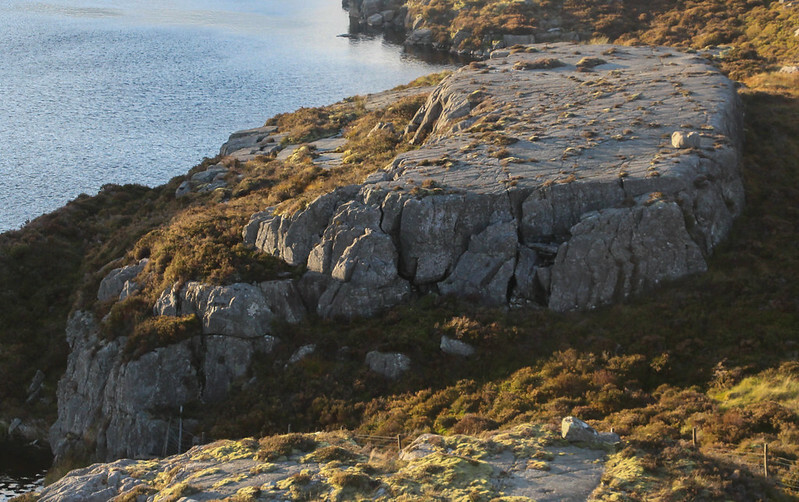 Here the map had suggested the summit ridge would offer shelter from the strong westerly winds, due to swing from south to north overnight, and a shelf in the hills just below held two small bodies of water, Llyn Twr-glas and Llyn Pryfed. Hopefully, here we would find a little flat ground on which to pitch. 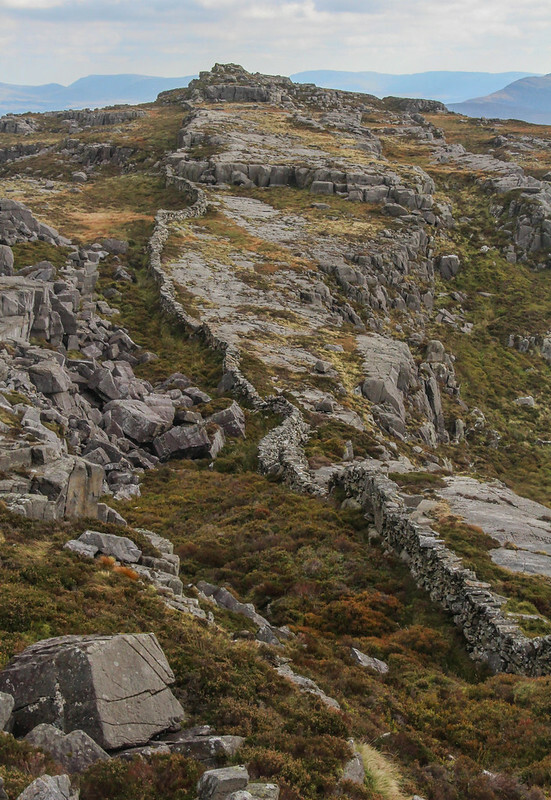 The final approach was mostly trackless, but first encounter with The Wall, a remarkably well built structure that winds its way along the whole spine of the Rhinogydd, meant the line was pretty obvious. 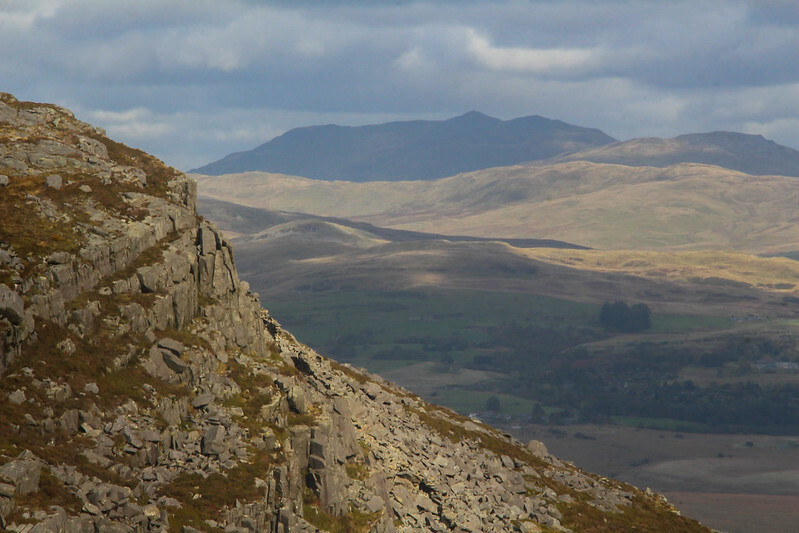 Soon, we stood below the top, looking down on the two llyns. There were a lot of rocks. 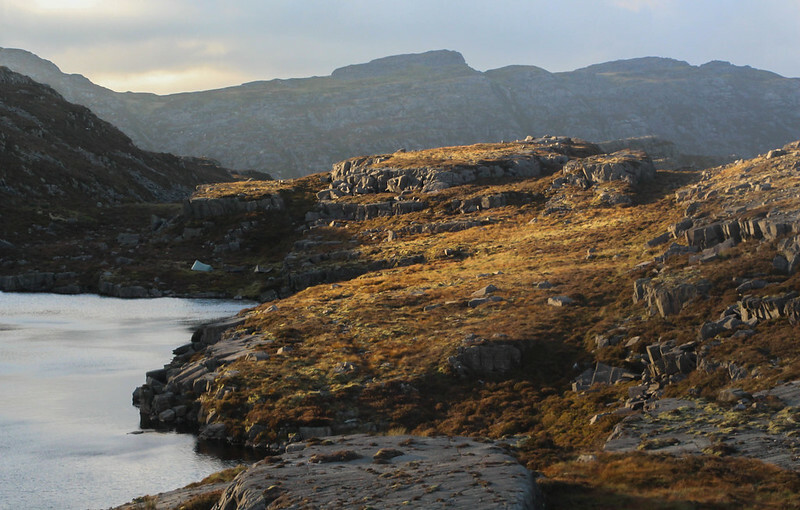 In fact, most of the landscape seemed to be rocks, with just a thin scrubby layer of mossy grass covering the flatter bits, except where there was tough and thick heather, upon which a groundsheet was unlikely to sit happily. Below, though, it did look flatter, but a steep heathery slope full of holes, as most of this terrain is, had to be negotiated to reach it. Ah, we'd now found our first bog. So, we split up to scout for a site. I headed towards Llyn Twr-glad, where I found lovely flat very wet bogs. 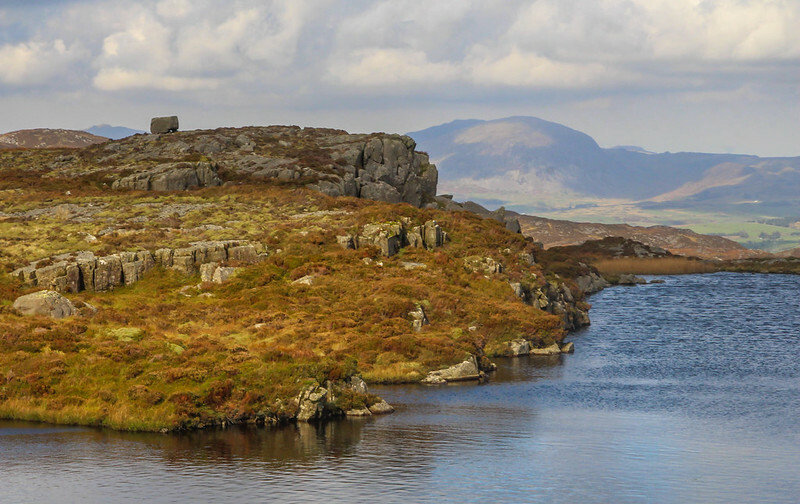 The lads went to rockier Llyn Pryfed where, miracle of miracles, there was a small flattish area of soft but solid ground in the most wonderful spot overlooking the length of the llyn. This was the spot I'd hoped for. After a moderate amount of faffing, our homes for the night were up. 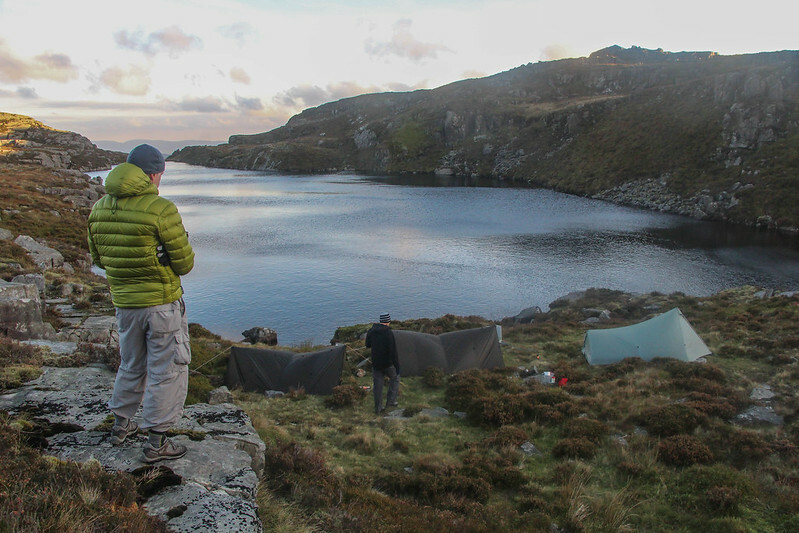 Nige and I had chosen to use tarps on this trip, leading me to attempt both a wind resistant structure and a lovely view from my sleeping bag. 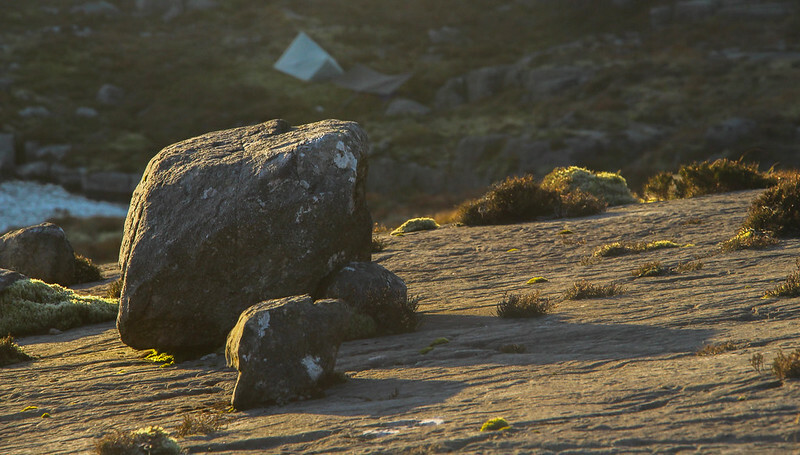 The sun was peeping through the clouds more and more often, and once our camp was secure, we went for a wander in the warm evening light. What a stunning place this is. Rock dominates Llyn Pryfed, from now on known as Llyn Perfect, yet in the evening light this was a warm and friendly place despite the cold wind. 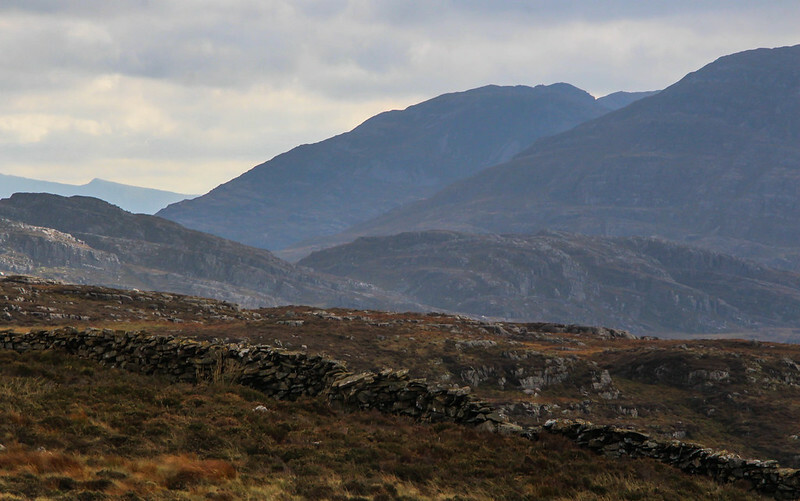 We wandered for a while, gazing out over the valleys below, before turning to look at our onward route. 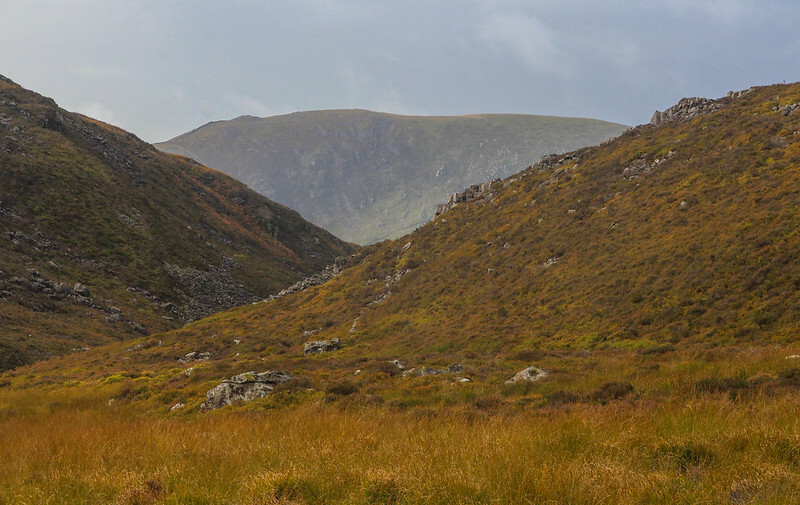 I love the time spent just exploring near a wild camp spot, the day's hard work over with, just leaving time to revel in the peace and spectacle of the hills. 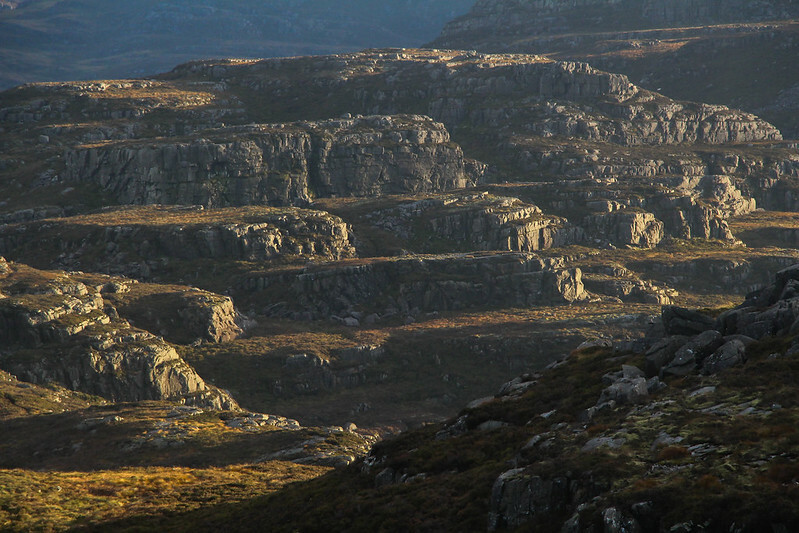 Here, we could clearly see the many, many rock terraces between here and the higher hills, the light and shade making their rugged nature all too obvious. 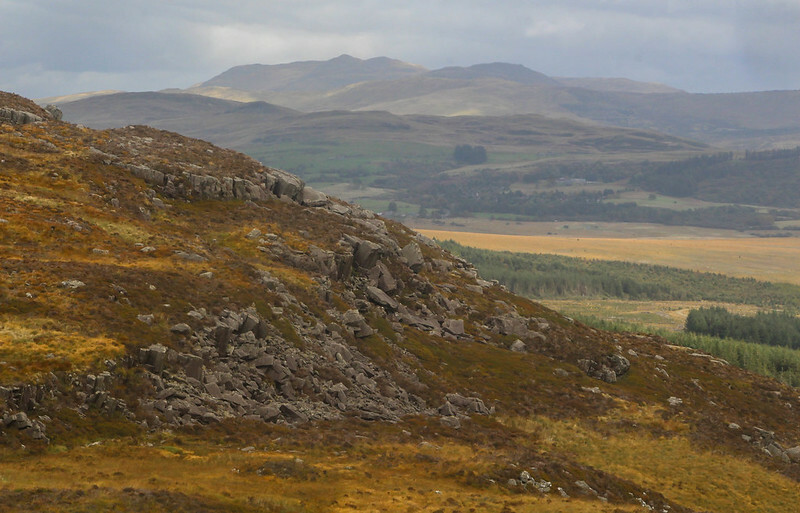 Behind, the main two hills of Rhinog Fawr and Fach loomed. 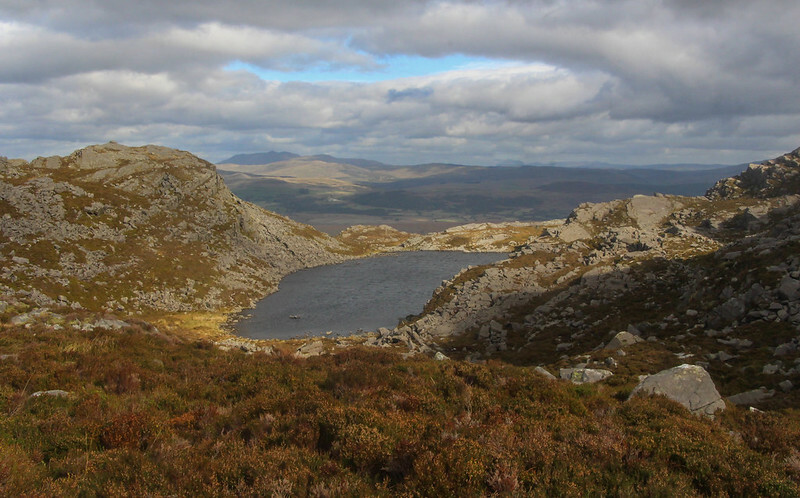 Tomorrow we planned to go over both, before dropping to a camp near Llyn Hywel. The Rhinogydd, though, had slightly different ideas. I'd volunteered to cook tonight, carrying a little extra weight to provide a fresh pesto pasta meal, but knowing my pack would then feel a little lighter. Once more, each of us attempted to reduce our carry weight further by offering up gas cylinders for use as quickly as possible. We had somehow contrived to carry 4 of these things, despite our pre-trip conflabs. We also happily off loaded another bit of ballast as quickly as seemed decent - each of us had brought a dram or two with us. Well, pretty much two bottles worth it turned out, decanted into lighter containers, so peaty Highland Park and smoky Laphroaig kept us warm in the cold wind. As the evening progressed, the clouds broke and returned several times. The clear spells were simply magnificent, for above us the stars wheeled and sparkled, the milky way clear above our heads, and we even got to wave at the International Space Station scurrying brightly across the sky, 500m closer to it than I normally am. As we headed for our warm sleeping bags, the stars fled behind hurrying clouds, and the wind started to find chinks in the armour of our tarps. 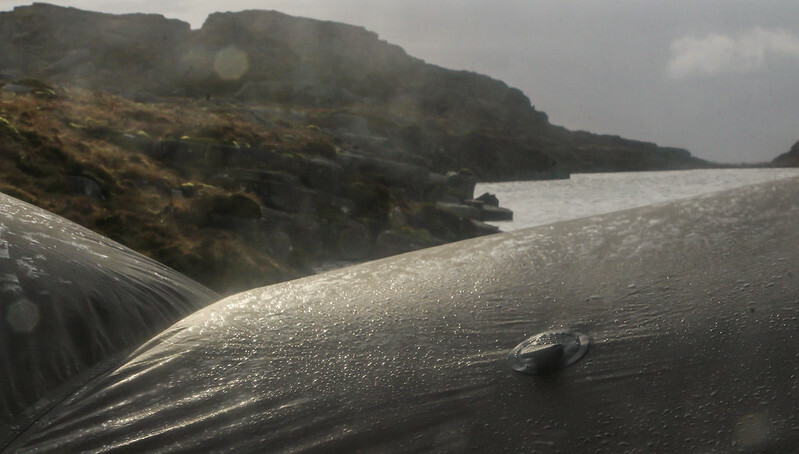 By now, condensation was an issue, but once in my toasty bag and bivi, the wind soon dried this off. Waking in the night, though, I did ponder the sanity of leaving one side open for a view. Said view being the inside of a rather damp cloud, which was keen to join me. 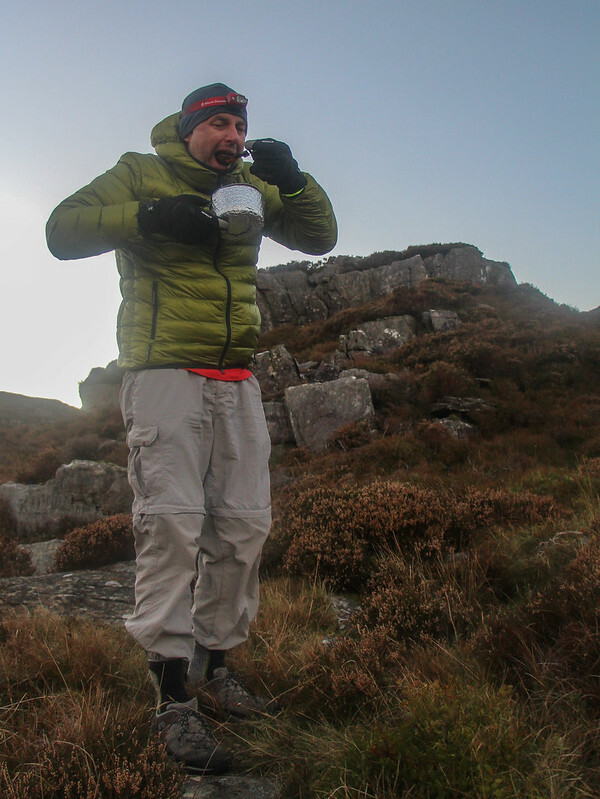 Nigel also related how he'd never previously experienced clouds actually blowing through his accommodation. 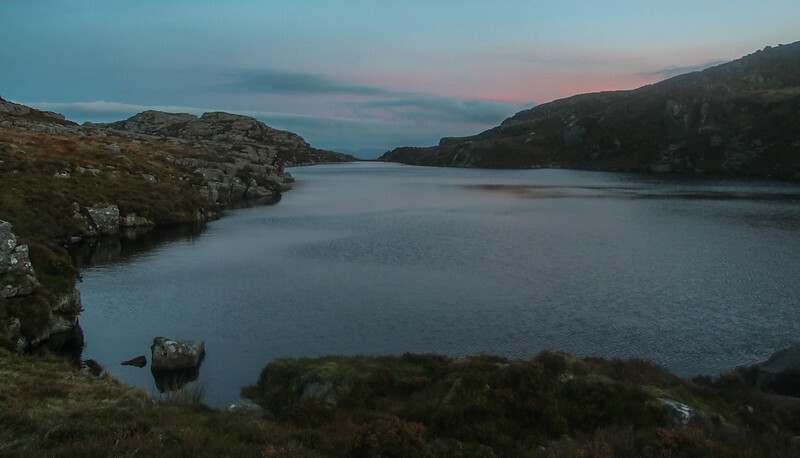 As first light came, I'd actually had some pretty good spells of deep sleep, but early morning brought only mist so thick that the llyn had all but disappeared, giving me the impression of camping on the edge of a big white drop. So I turned over and went back to sleep, safe in the knowledge that the forecast would bring better weather by late morning, and we'd agreed that there was no hurry to be off. After all, we only had about 6 miles or so to travel in the morning, we'd have plenty of time. Wouldn't we? I waited for quite a while for one of the lads to surface and put the water on. They each also waited for quite a while for one of the lads to surface and put the water on. Eventually, I gave in, thanks to pressure from within. 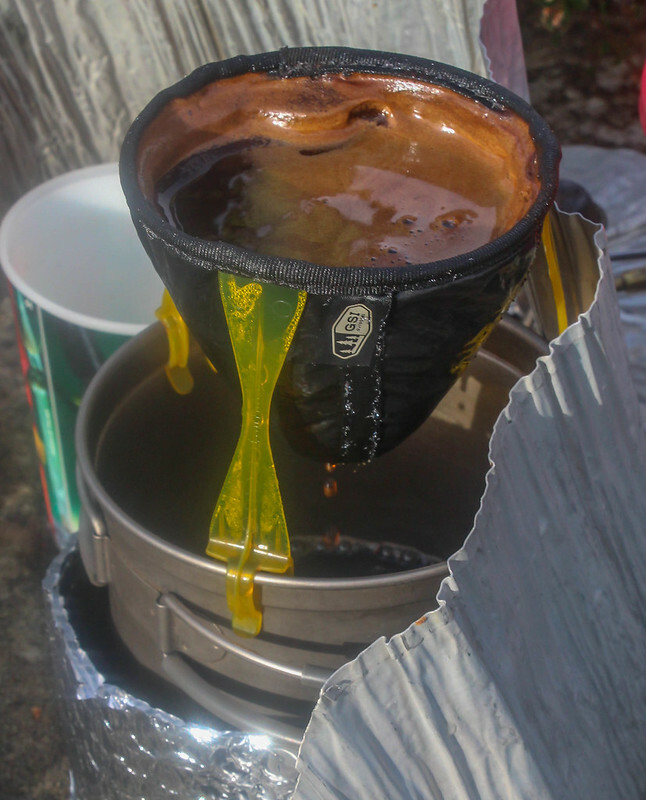 Soon the coffee was on, a decent brew being another requisite on my camping trips. 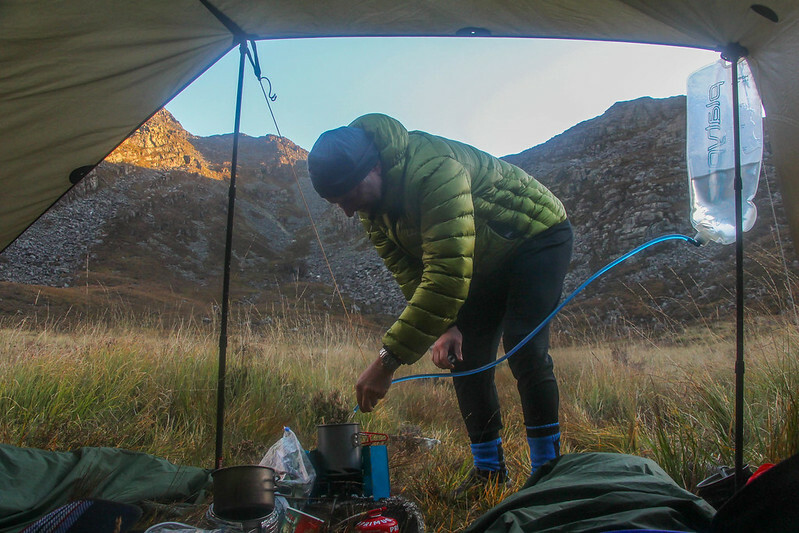 Normally at this point we'd be deploying large quantities of bacon, black pudding and cheese, but this time, being a lightweight trip, the porridge came out. I though, consider porridge to be more of a building material suitable for gluing bricks together, than a food stuff, so had carried up a bag of Honey Cheerios and some breakfast bars instead. As such things go, it was actually pleasant enough. 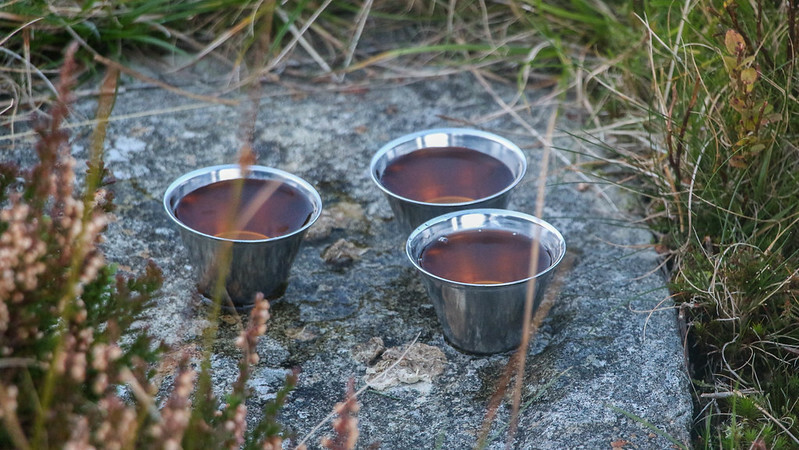 A second round of coffee was very welcome too, and had the desired effect for each of us, making us take it in turns heading for a suitable spot with a view, for contemplating our surroundings. 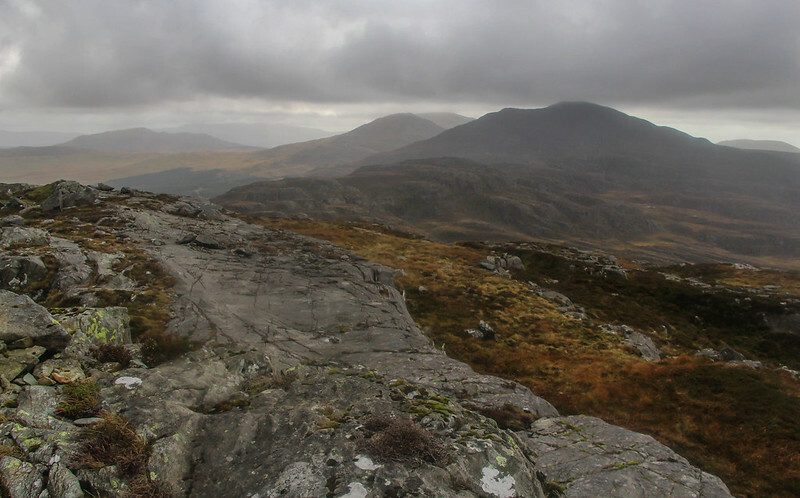 We scrambled our way up to the little pointed top of Craig Wion, via a clamber over The Wall, with the clouds and the odd bit of drizzle still with us. The wind was very obvious too, but coming from behind us as we turned to survey the route ahead. It looked pretty wild, but in a good way. I was really looking forward to the next part. Our loads were actually pretty light, compared with some trips, and not really causing us any problems. Despite the onset of an annoying cold, I was feeling pretty good. We dropped gently and easily from Craig Wion, the faintest trace of a path helping us. 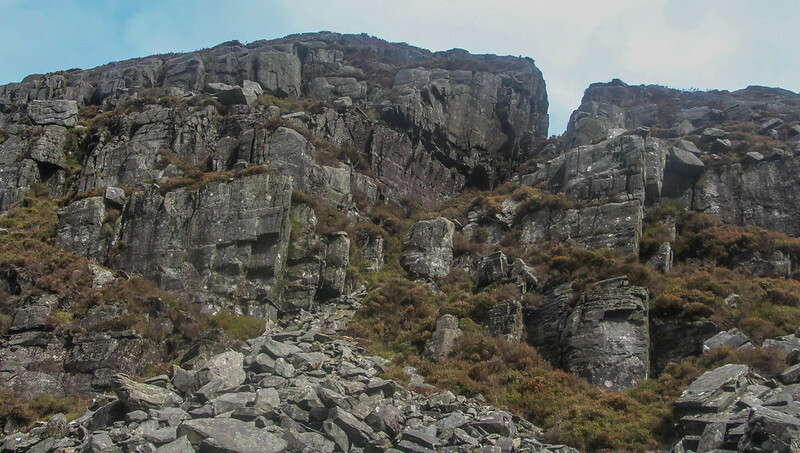 Ahead, the knobbly spine of the Rhinogydd looked fabulous, the route not at all clear. 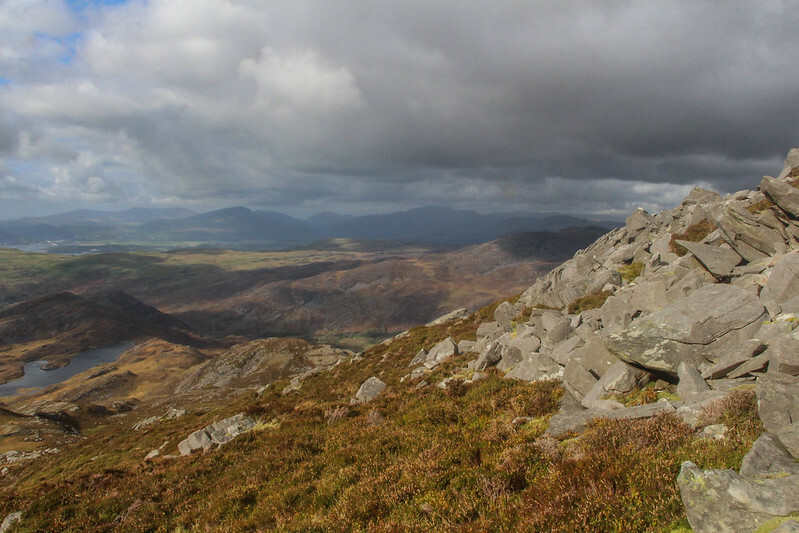 It seemed we'd have the choice of either contouring around the western slopes through rough heather and tussock, or sticking to the highest points and clambering up and down the rock terraces. We'd read that the latter was arguably easier, but more to the point, it sounded like far more fun. And so it proved. Though it never climbed much above 500m, we were constantly either climbing or descending short distances. 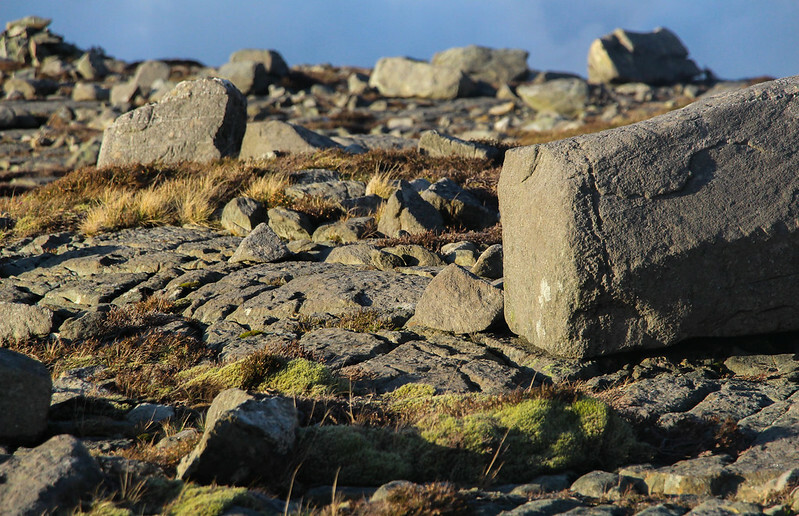 At times, we wandered easily across rock pavements, or followed tiny paths through the heather. Every now and then, though, a horizon line would appear ahead of us, and we'd find ourselves on the edge of a miniature canyon. 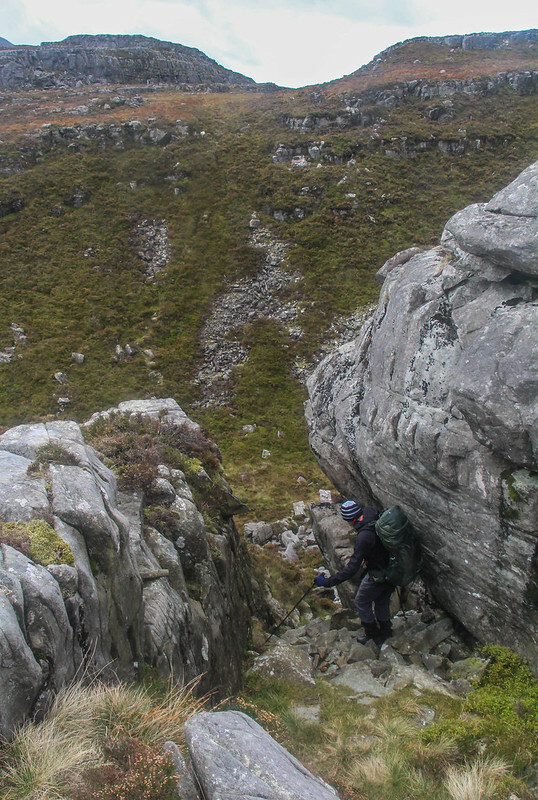 Coming from the north, the drops into these were rough and rocky, a scrambly gully initially being followed by big, bouldery scree. The climbs on the other side tended to be less technical, but very steep and heathery. Each ravine would probably cost us a good 15 minutes, for a distance that should have taken about 2 minutes on the map. On each little top, we'd look ahead and attempt to guess the best route. Eventually, things eased a little, and below us on the right we spotted the wind-ruffled surface of Llyn Morwynion, meaning the pass of Bwlch Tyddiad was close. 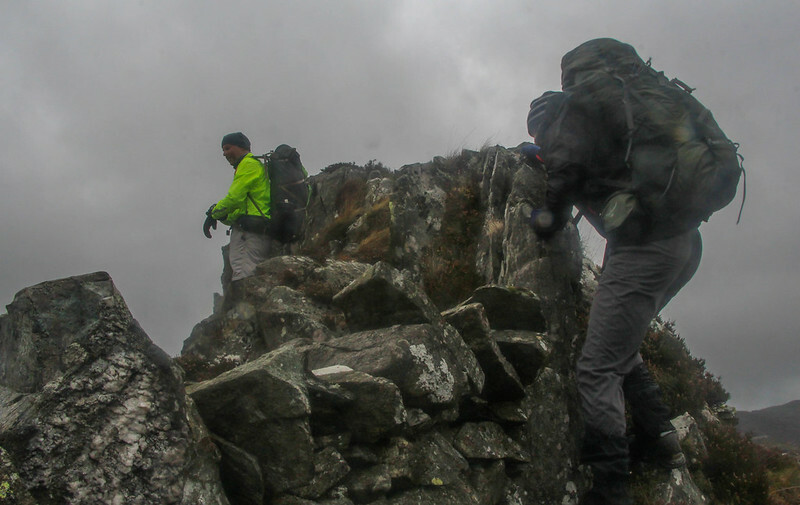 A last maze of rock and tussock brought us to a final descent and, incongruously after 24 hours without seeing a soul, the sight of a bright orange jacket walking below us. Bwlch Tyddiad was once a major thoroughfare through these hills, a packhorse route from the metropolis of Chester to the outlying fortress of Harlech. Stone flags on its western approaches are known as the Roman Steps, though actually date to Medieval times. 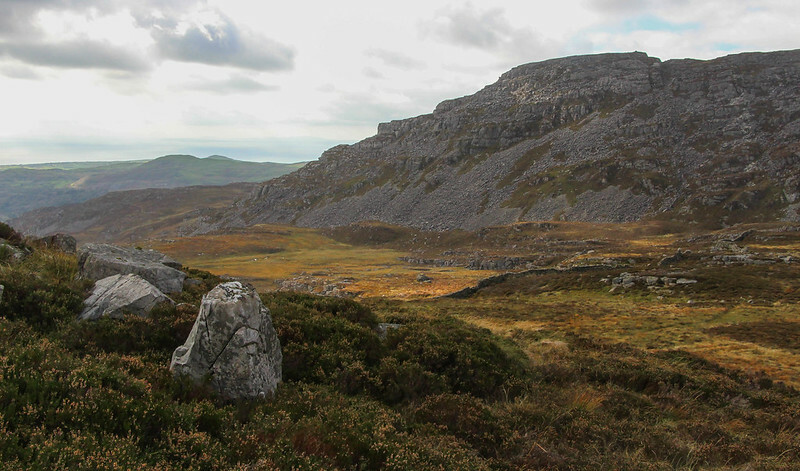 We didn't visit them on this trip, as we turned east for a few hundred yards before our next climb, but clearly they are not entirely obvious, for the first and only couple we met, as we lunched just below the high point of the bwlch, asked us how far it was to the Roman Steps. They'd just climbed them, the lady in nice shiny black leather shoes that somehow remained immaculate. Lunch over, it was time for a bit of effort. 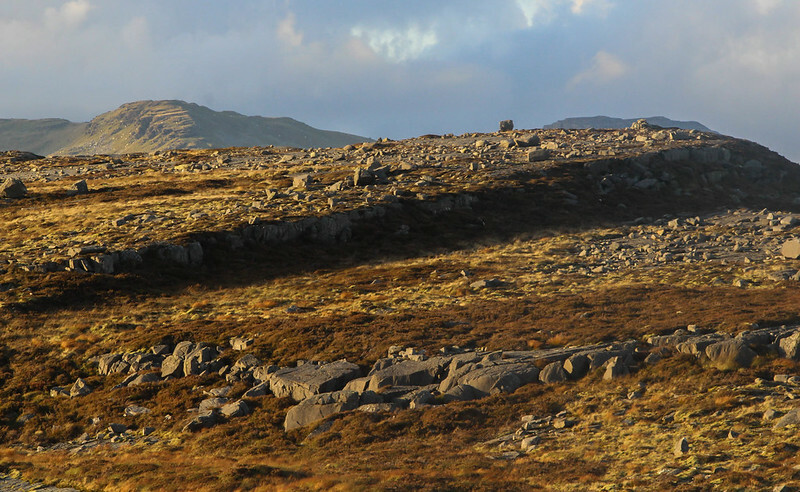 Our first proper hill, Rhinog Fawr, dominated the pass to the south, the slopes facing us rugged and steep. A small path, the first proper one for a while now, meandered leftwards into its north east corrie, climbing towards Llyn Du. 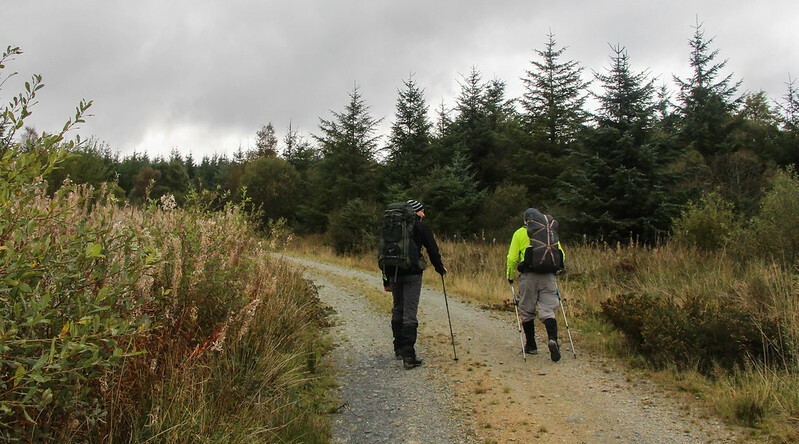 The legs felt strong though, and the packs were not the encumbrance I'd expected, and we made quick work of the climb to the llyn. Here we used the outflow to top up our dwindling water supplies, via a couple of Sawyer Mini filters. On the map, the path upwards heads south of the llyn, but at the time, the one on the northern shore was far more obvious and this is the one I chose. 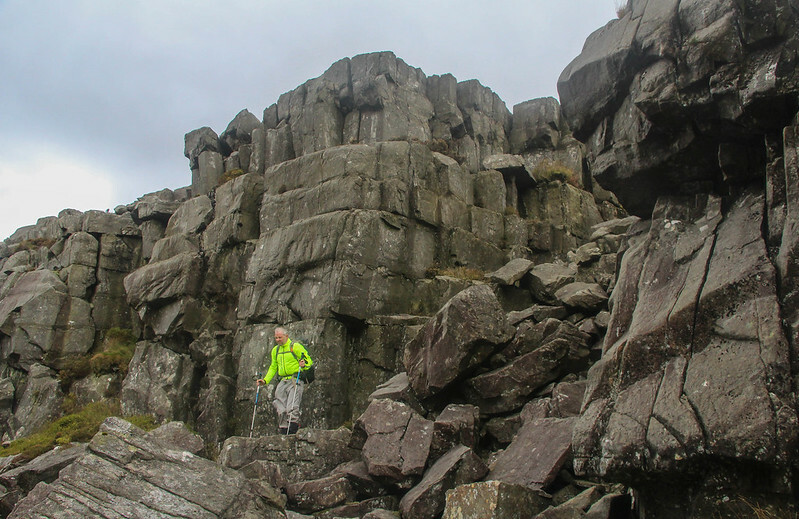 A tumble of blocky scree was fun to hop across, the rocks firm and solid, before we met The Wall once again. This remarkable structure had taken a rather more direct route to this point, and now we followed it upwards onto the western flanks of the hill. 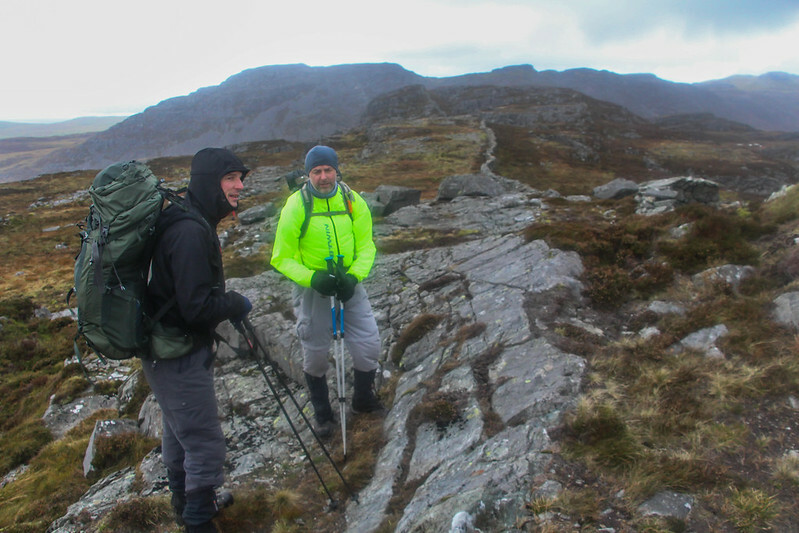 Though we were now on paths, the best route still wasn't that obvious, and we chose to work our way to the west to a gentler ridge, rather than tackle the steepest route directly. 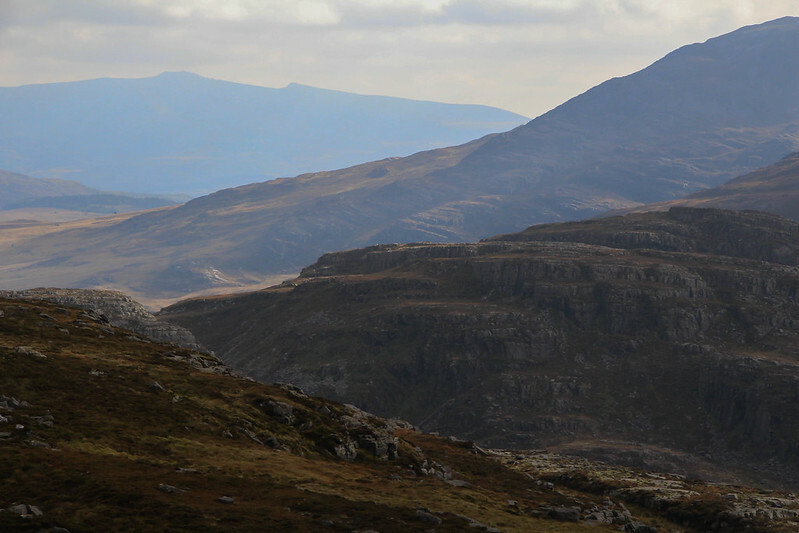 On our right, the view was fabulous, and behind us to the north, the Snowdon Massif was clear of cloud. 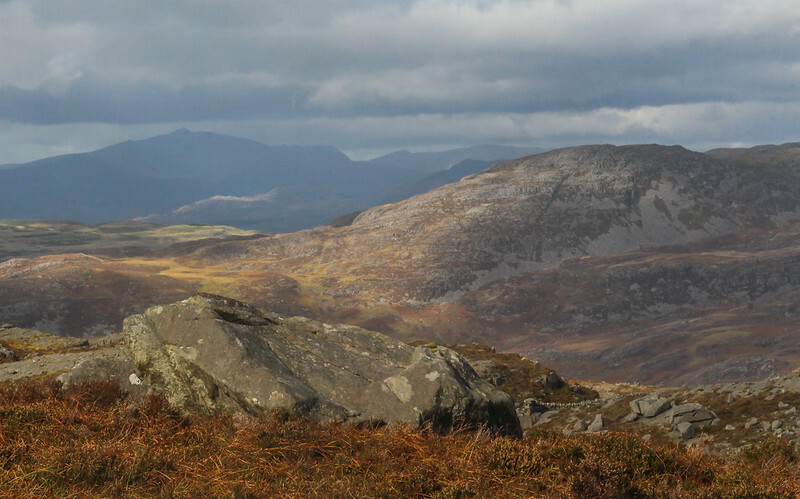 These Rhinogydd are truly great hills, reaching skywards in that magical zone between sea and the rolling inland hills. Perhaps strangely, we didn't pause at the summit. I for one, was slightly distracted by the thought of the descent ahead. 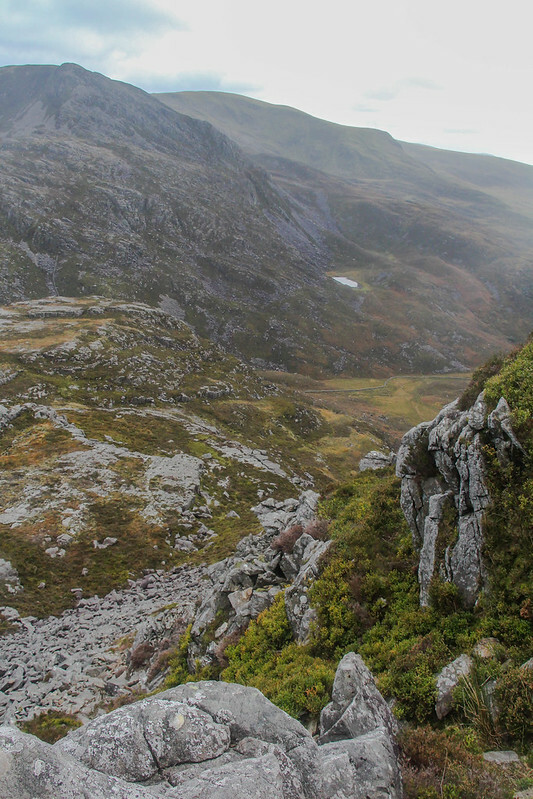 Both map, and research, had told of difficult route finding through rocky crags, ledges, scree and deep, hole-filled, heather. As navigator, I simply wanted to get on with it. 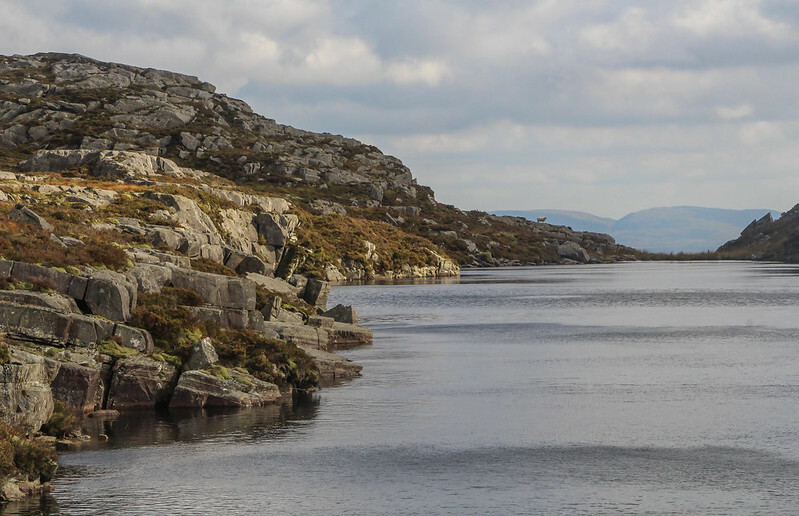 The views ahead to the spectacular surroundings of Llyn Hywel, squeezed into its rocky fold between Rhinog Fach and Yr Llethr, constantly drew the gaze though, so we paused briefly. 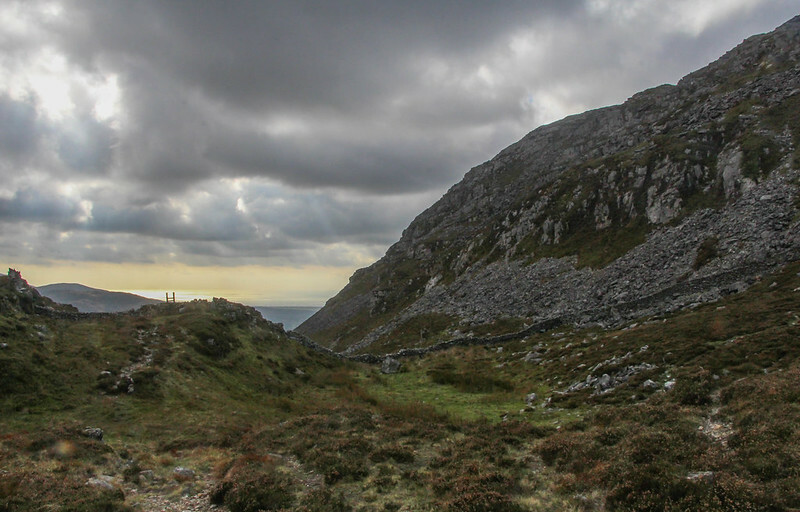 Drws-Ardudwy, 400m below. We'd then either take that, if it looked doable, or head more SE to zig-zag down the many rock ledges in that direction. The first part was easy, a clear path, obvious on the map, taking us to a spur that pushed out to the east. From here, we worked out way down, still on a path. At times, we stopped to peer ahead, for the path wasn't big enough to be obvious very far ahead. A few hundred feet below the top, a ledge took us rightwards on the most obvious path so far. And then it seemingly ended, on the edge of nothing. 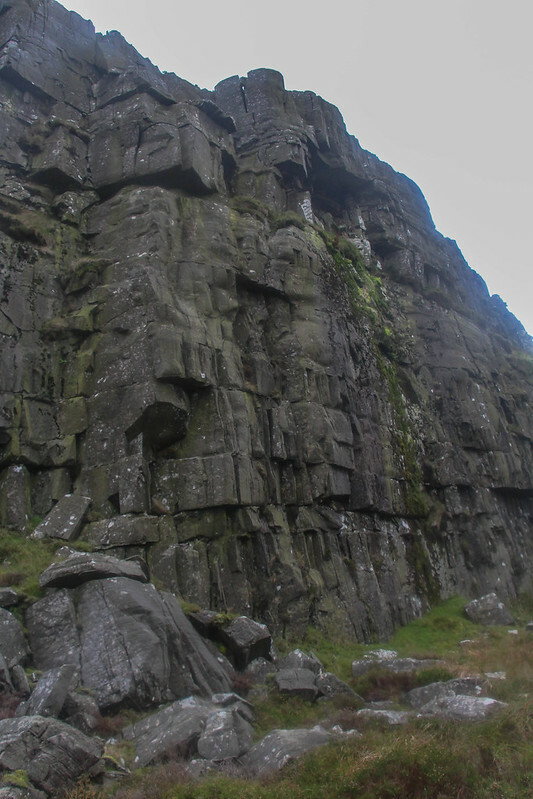 The route onward appeared to be straight down a cliff, a hundred feet or more high. 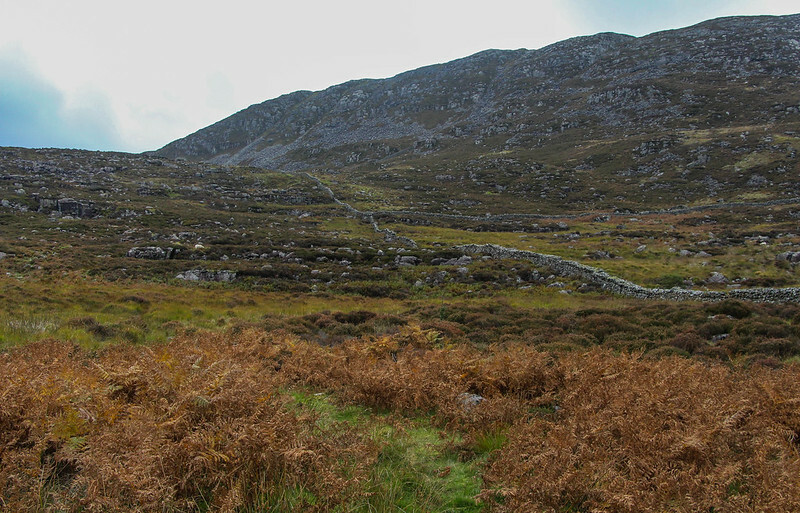 Fortunately, on closer inspection there was a break in the fortifications, and a rough gully led to scree below. 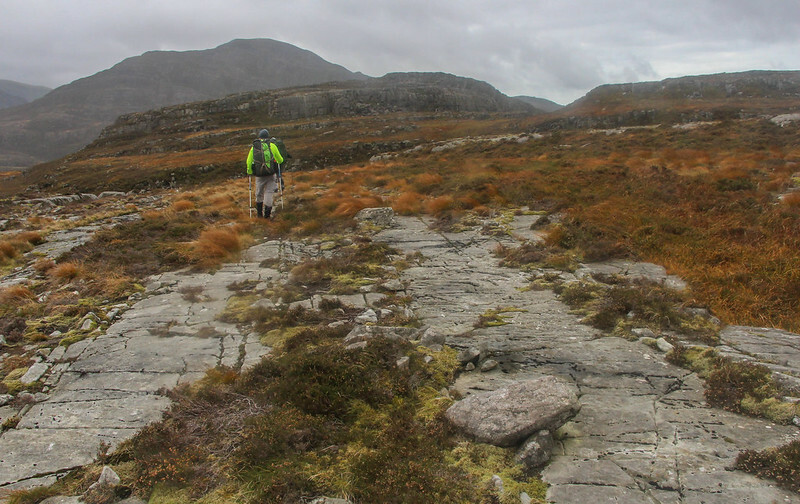 A "path", for want of a better word, worked its way down the right flank of the first scree. It would go, and if it ever got dodgy, we'd return and find another way. In the end, it was fine, just a place to take a little care, and to give each other a little space. 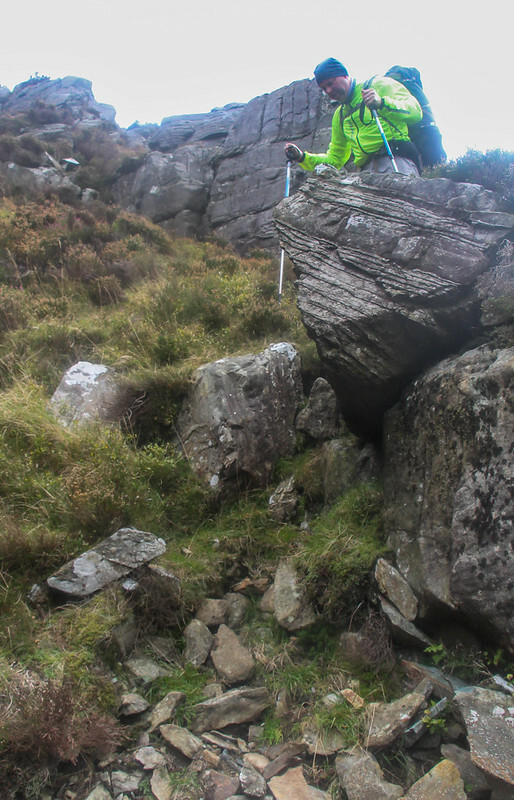 This brought us out at the top of the big gully that dropped straight to the lower bwlch way below. 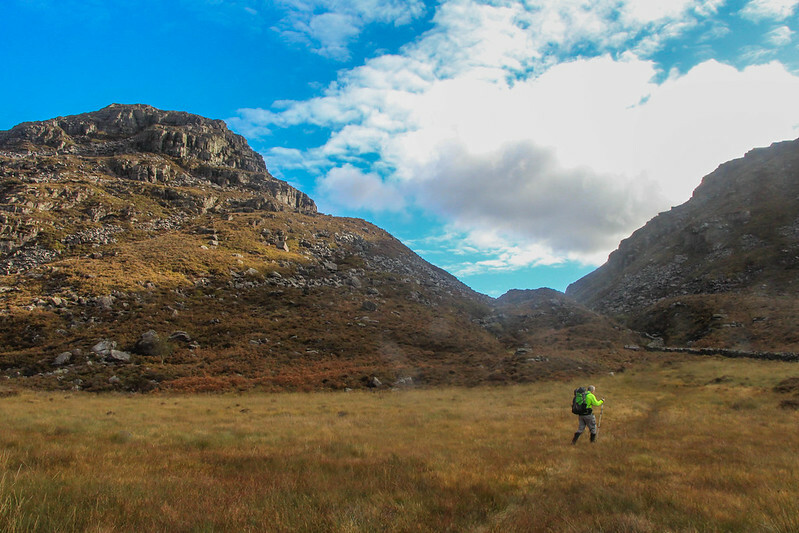 However, the path, marked by a couple of reasonably substantial cairns, crossed over and continued on the other side of the hanging valley above the gully, so we followed that. 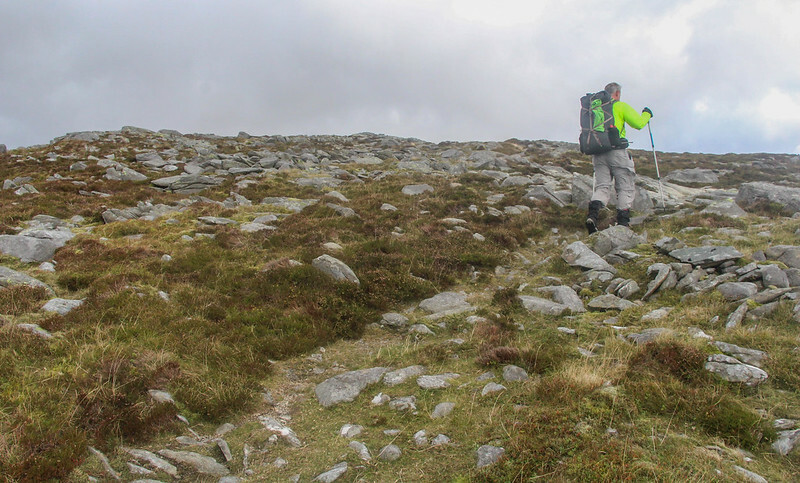 After zig-zagging down more rocky steps and little screes, we had the choice of turning right back towards the gully, or following the occasional tiny cairns to the south east. We chose the latter, at least we knew people had been here before, and for once I was happy enough to see cairns in the hills, these ones were very useful. A final stone pulpit gave us an outlook on the bwlch below. Ade hasn't done much of this stuff before, and I detected a hint that he was out of his "zone of experience", so tried to be extra careful that each negotiated step was OK for an active beginner. And they were. At no point was this descent worrying, each move was just a simple scramble at worst, but also, at no point was this descent obvious, every step of the way required thought and route finding. And it was steep enough to give pause for thought, no place to stumble or trip. 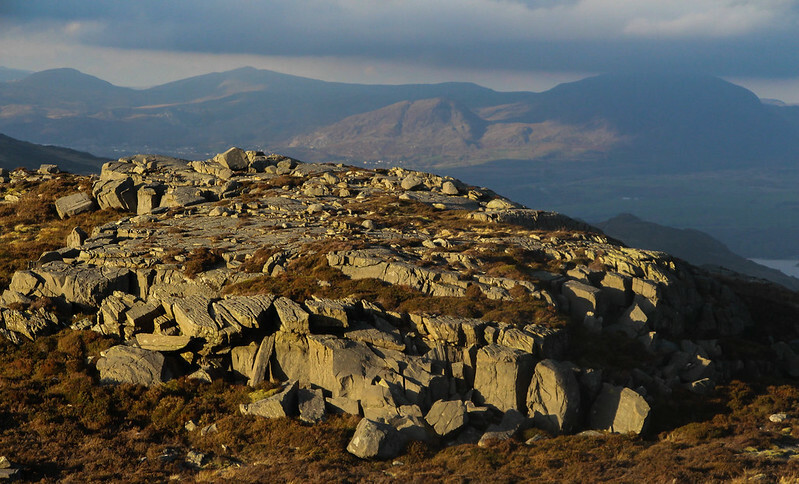 At last, a simple final scree, and a gentle grassy slope, separated us from the large cairn that marked the high point of Bwlch Drws-Ardudwy. We were down. It was about 4pm. We'd been going for 5 hours. Yet we'd barely made 5 miles, and apart from the one lunch stop, we'd kept a decent enough pace. Such is this terrain, not one to be underestimated. Given the time of day, we considered our options. 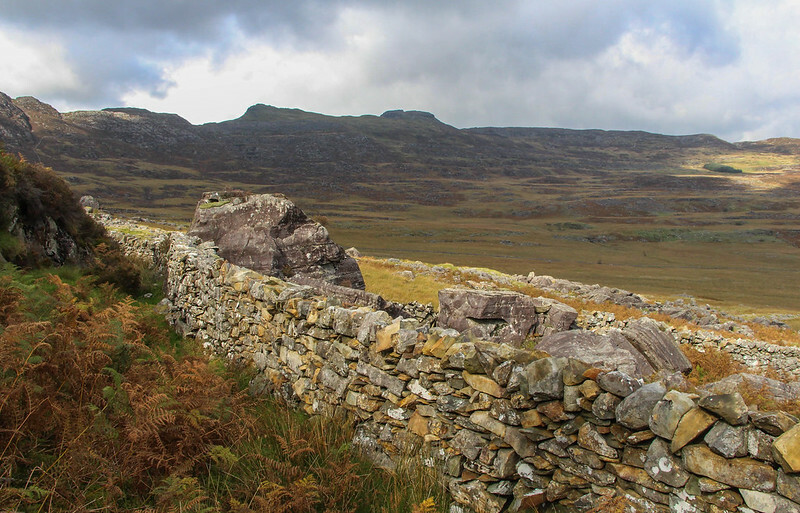 We'd hoped to climb up and over Rhinog Fach, before dropping to Llyn Hywel. I'd long since abandoned this idea, and the ridiculously steep heather climb opposite our descent route, but had still thought we'd get up to the Llyn. However, the wind was strong from the NW, and this was blowing straight at Llyn Hywel, as we'd seen from above. Thinking the only likely looking camp spot there was near the lip, exposed to the wind from this direction, we decided against going up so high. Llyn Cwmhosan looked a better bet, halfway up, but first we'd drop down into the bigger cwm in the pass to the west, which had looked likely to contain a number of camp spots. It was only half a mile, and a couple of hundred feet of drop, to the flatter areas where we hoped to camp at around 300m. It won't surprise anybody familiar with Wales to hear that most of it was one big tussocky bog. However, the winds higher up were obviously still strong, and I didn't fancy getting up to Cwmhosan and finding it full of swirling blasts, as I've found in such places before. Here in the valley, the wind was minimal. After some tired exploration of options, our minds shutting down after the total concentration of the descent, we kept coming back to the same spot, a little dry patch on faint path. So that became home for the night. Nige and I combined tarps to make a palatial communal room, whilst Ade pitched behind us. 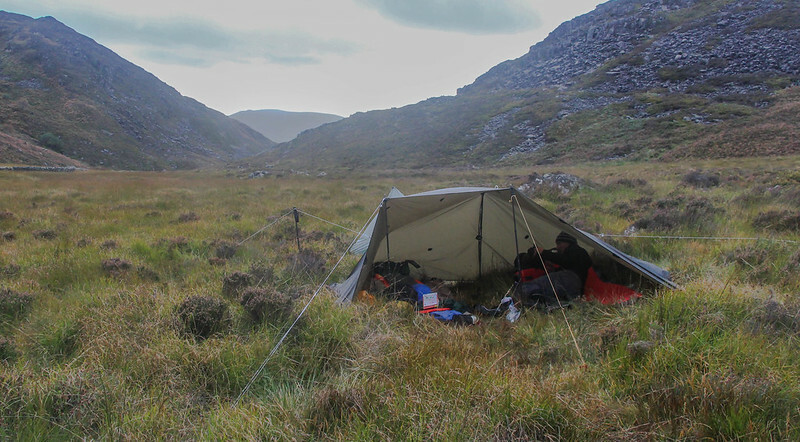 Despite the unlikely location in the middle of a bog, as soon as we were set up, we were content and happy with our accommodation. Such is so often the case. 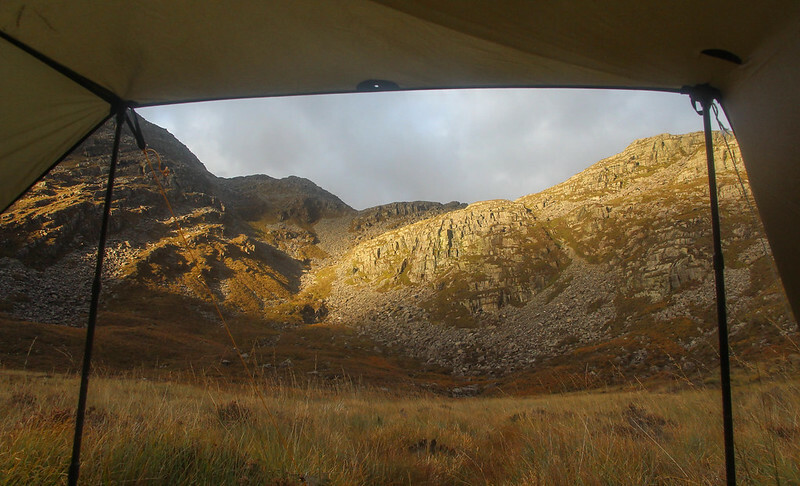 Nige and I, in our Tarp Palace, had a great view of the craggy cwm above, and Ade joined us for a meal and much of the rest of the whisky. 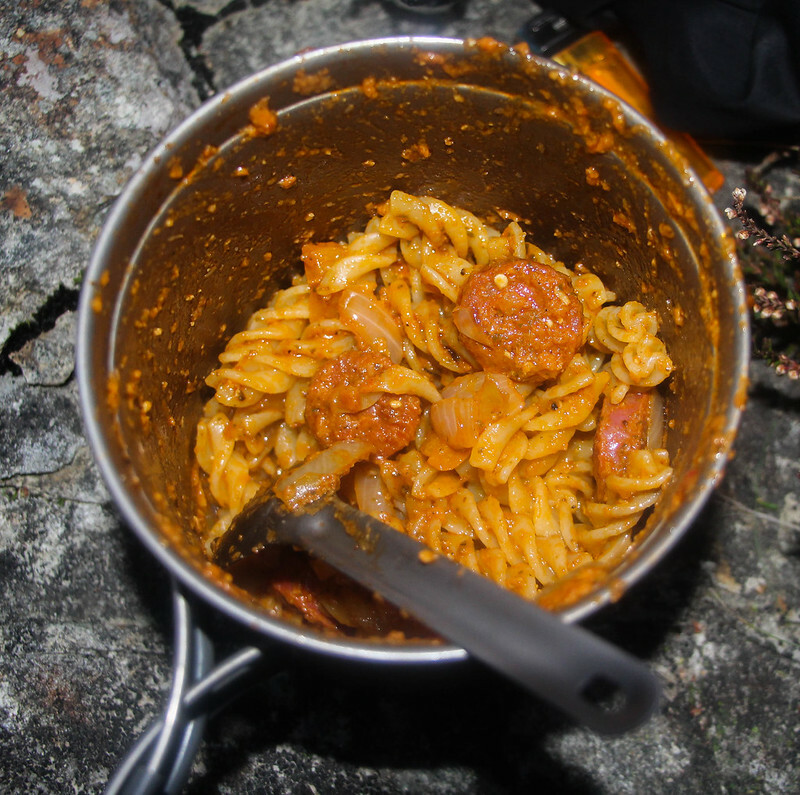 For this second night's meal, we'd each done our own thing, and actually resorted to bought dehydrated meals. To this end, we'd all become obsessed with calorific values, and could talk about our chosen meals energy provision far too easily for comfort. At some point, we realised that the emergency "back up" 90p Super Noodles, that Nige and I had each carried, actually had a higher calorific return than the £5+ meals we'd bought. So they were pudding. On the whole, though, the meals had actually been quite tasty and filling, things have moved on since the old days of Raven rations that I remember from teenage trips to Iceland and other such places. That night, the stars came out again, framed by the hills, though the view was not quite as spectacular as the night before. I slept well, despite my cold now being pretty full on. Laphroaig mixed with Cold Relief Capsules seemed to work. In the morning, though, I felt pretty rough, head blocked, ears blocked, dizziness when bending down low, probably caused by the blocked ears, and a lack of energy. Fortunately, room service brought coffee in my sleeping bag, but still, I decided enough was enough. 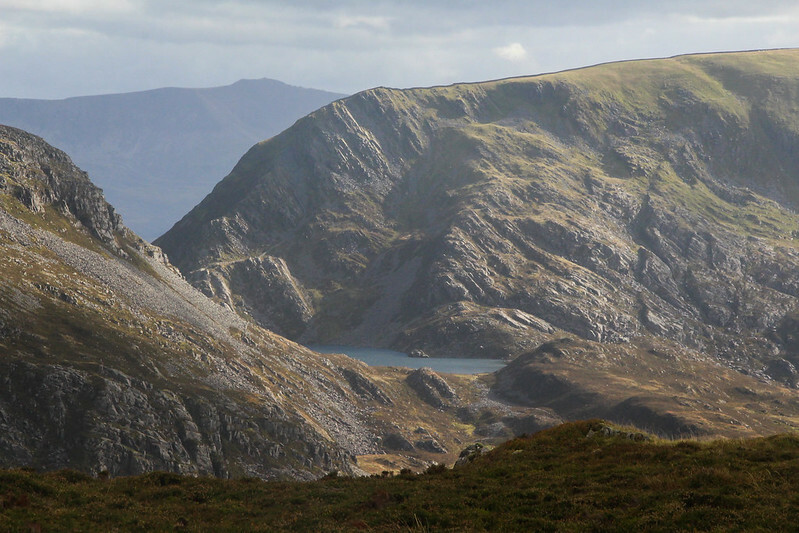 We'd hoped to climb up and either over Rhinog Fach, or at least to Llyn Hywel. I'd particularly wanted to get there, and to the slopes of Yr Llethr above, having followed the images of local photographer Nick Livesey, for whom these are special hills, for some time now. That will have to wait for another adventure though, as we still needed to walk back to the car, and then I, as only driver and with a head cold, needed to get us back to the South East. We packed up at a leisurely pace, enjoying a decent spell of weather, though that was due to close in. The short climb to the pass was actually fine, though the head felt weird until I stopped going upwards. From there on, it was easy going, and soon we were on a big path, followed by gravel roads, back to the car. So, after approximately 48 hours on the hills, spread over nearly 3 days, we'd covered barely 18km, rather less than my original plan of 30km. The ascent and descent was under 1200m, theoretically at least. Each step, though, was hard one, and the terrain is remarkable. To mix my units a little, we'd averaged about 1 mph. 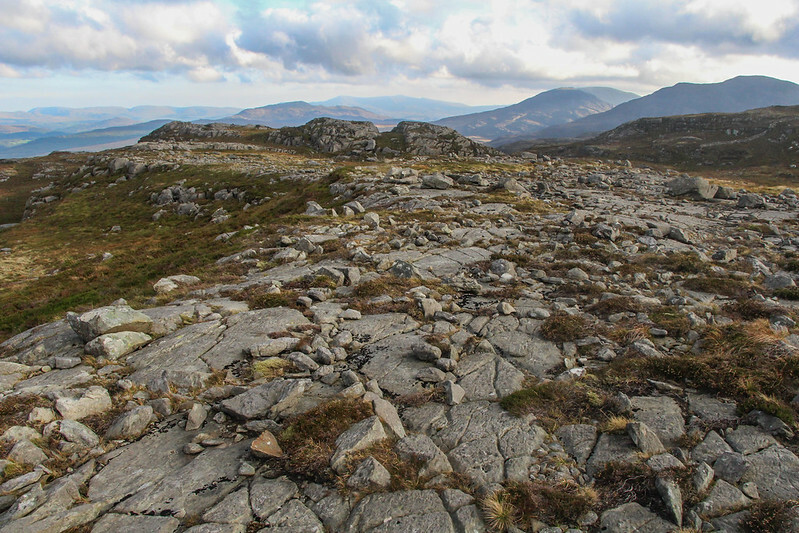 With many years of experience of the wilder parts of the highlands, I can honestly say that parts of the Rhinogydd are up there with some of the roughest hill country I have walked through in the UK. Its amazing that such a place remains almost trackless, that so few people walk the ridge itself, and that in 48 hours, we met and spoke to only one couple. 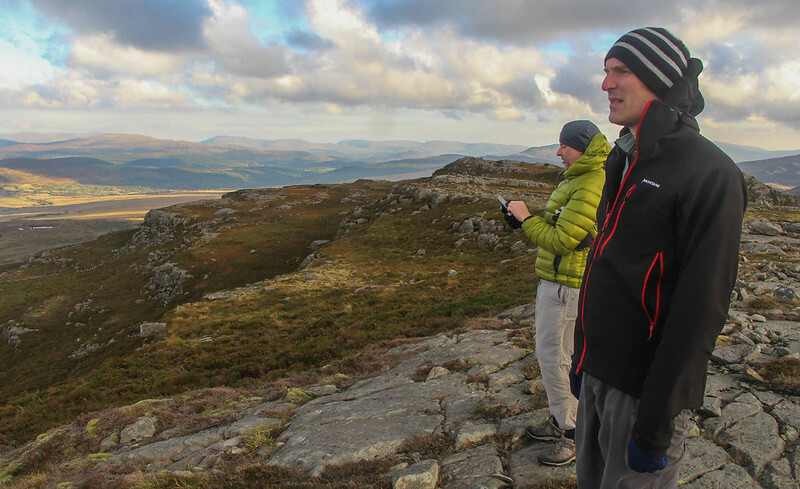 The true joy though, came simply from the experience of spending time in the hills with mates, the hours spent just sitting and gazing, absorbing and soaking up the feel of this wild country, being arguably far more rewarding than the walking itself. 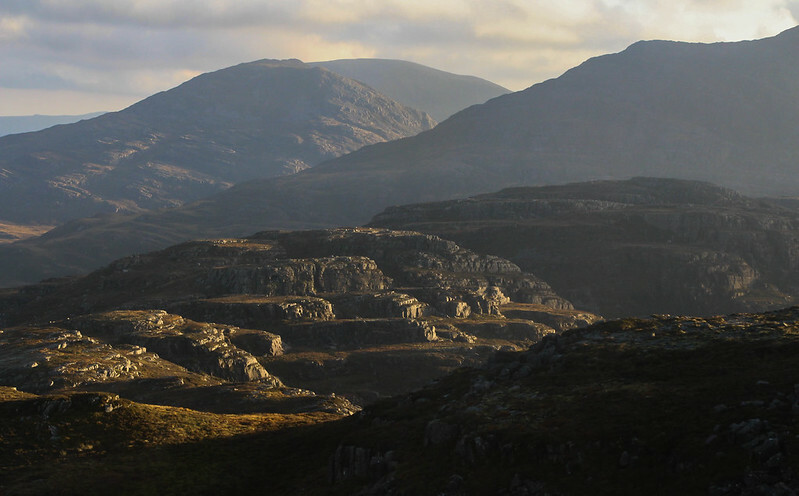 I am actually quite pleased that we only touched the surface of the possibilities in these wonderful hills, for now I get to plan a return to one of the most remarkable places in these isles. Interests: Grew up going to the hills but only get to the hills occasionally, particularly for a week each winter. Big love is open canoeing, and particularly canoe camping. So I paddle the Highlands more than I walk them. 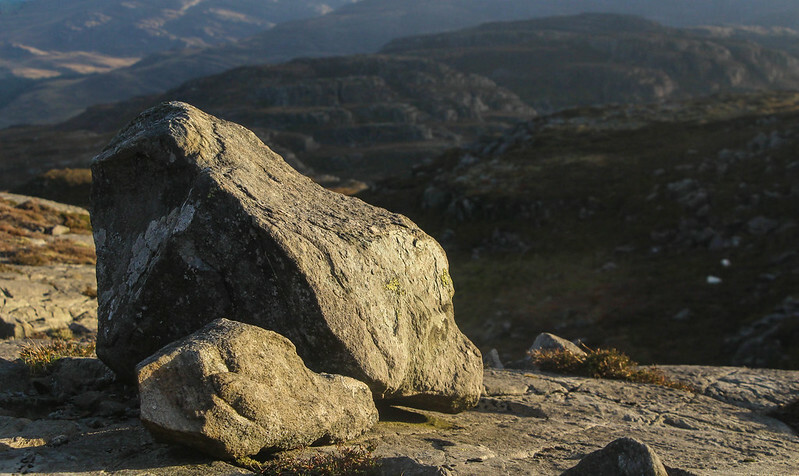 Ideal day out: Perfect crisp winter conditions in the NW Highlands where the snow is firm, the sky is blue and the views across hills, loch, isles and sea are endless. An early morning canoe paddle on a glassy calm loch with the hills reflected in it like a mirror isn't bad either!